The Best Western Athens Inn is ideally located in the center of Athens. Come and experience our hotel near the major tourist attractions. Best price guaranteed and exclusive deals. 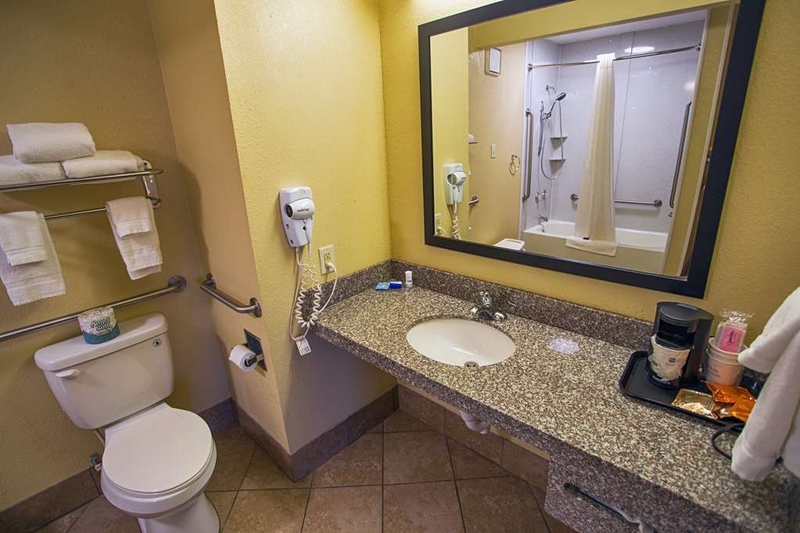 We take pride at the Best Western Athens Inn to make sure everything is spotless for you. 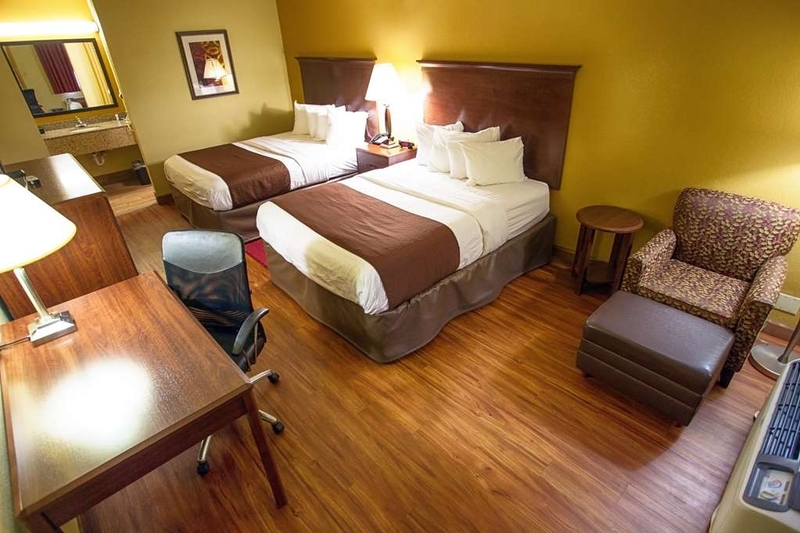 Pull up and make yourself at home at the Best Western Athens Inn. Come and enjoy the elegant lobby offering a place to socialize with other guests or members of your party. Our 24-hour front desk will go above and beyond to provide you unmatched customer care from check-in to check-out. Business and leisure travelers alike will notice our lobby is the perfect refuge for today’s tired traveler. 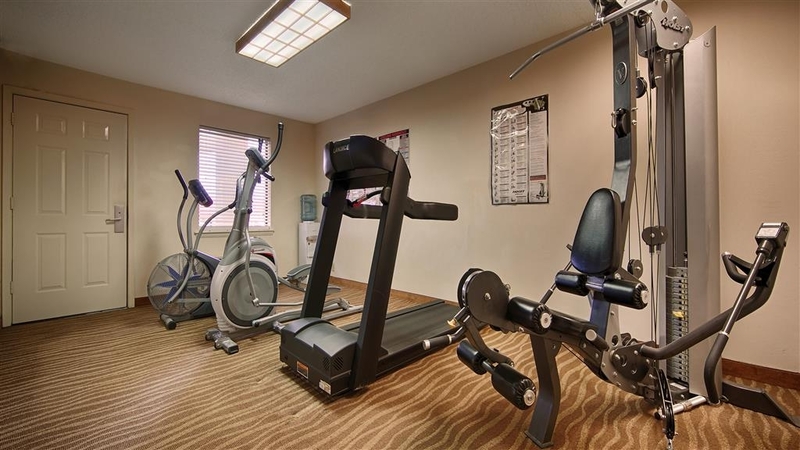 Stay healthy while visiting Athens, AL in our on-site fitness center. Our Standard Two Queen non-smoking room comes with a 40-inch LCD TV, refrigerator, coffee maker, hair dryer, iron and ironing board. Our Standard King non-smoking room comes with a 40-inch LCD TV, refrigerator, coffee maker, hair dryer, iron and ironing board. 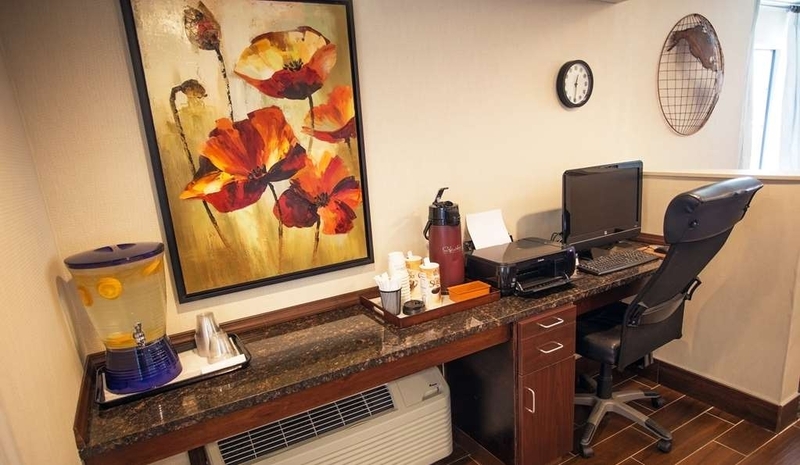 Our Standard King non-smoking ADA mobility accessible room comes with a 40-inch flat panel LCD TV, refrigerator, coffee maker, hair dryer and iron/ironing board. 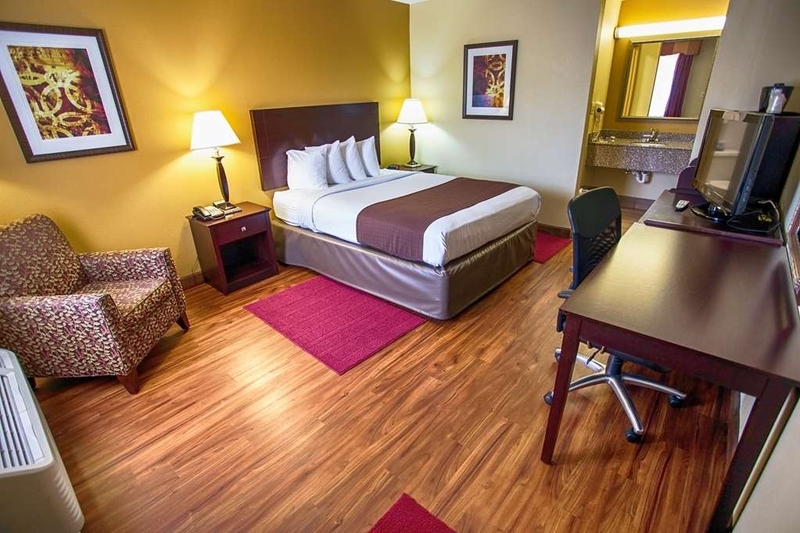 Our Single Queen pet friendly non-smoking room has a 32-inch flat panel LCD TV, coffee maker and hair dryer. limited rooms available. Our Single Queen ADA mobility accessible non-smoking room has a 40-inch LCD TV, refrigerator, coffee maker, hair dryer, iron and ironing board. Single Queen non-smoking room has a 40-inch LCD TV, refrigerator, microwave, coffee maker, hair dryer, iron and ironing board. Two Queen pet friendly non-smoking room has a 40-inch flat panel LCD TV, coffee maker and hair dryer. limited rooms available. Two Queen pet friendly smoking room has a 40-inch flat panel LCD TV, coffee maker and hair dryer. Limited rooms available. Our breakfast includes a choice from a variety of breakfast favorites. Eggs , sausage , biscuits , gravy , cereals , muffins , build your yogurt and pancakes. 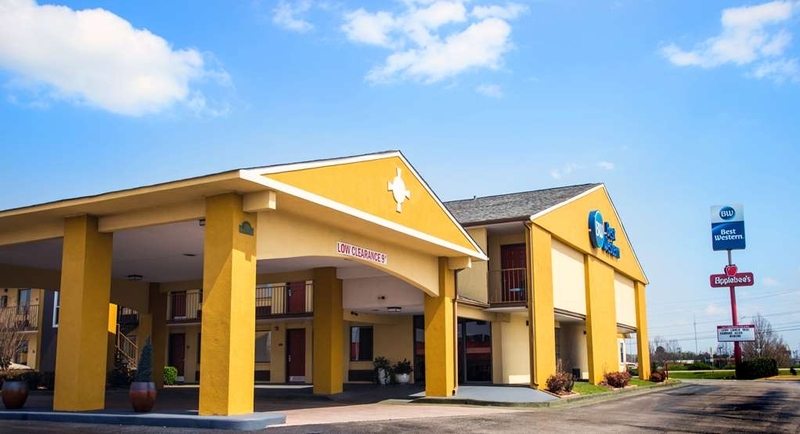 Directly adjacent to I-65, Exit 351, this charming Athens, AL hotel is conveniently located in the heart of the Tennessee Valley. The convenience of central location offers each guest easy access to local attractions and many outdoor activities. The Best Western Athens Inn provides a LIMITED NUMBER of pet friendly rooms with all of the amenities and superb customer service expected from Best Western. 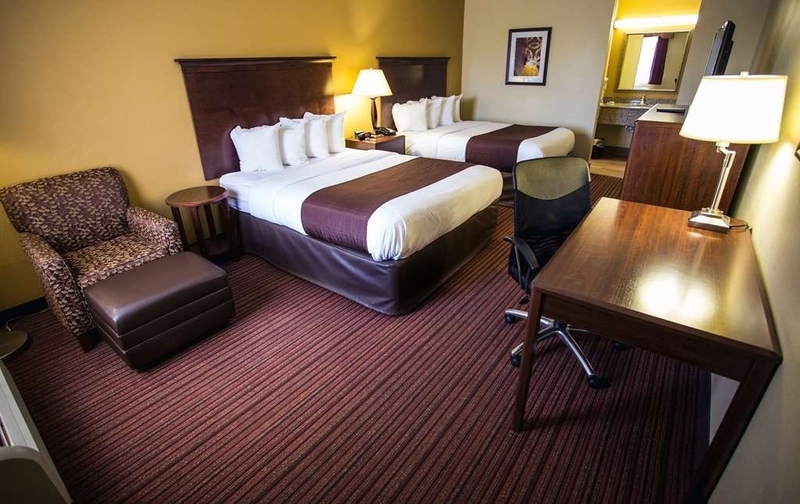 Our Athens, AL hotel is only three miles from Athens State University. Hotel guests will be close to a variety of restaurants (Applebee's, Ruby Tuesdays and Logan's Roadhouse) all within walking distance of the property. Each guest room features updated bedding and bath packages, free high-speed Internet access and cable satellite television with HBO®. A micro-refrigerator is available in some rooms (Microwave available upon request). The hotel offers a complimentary full hot breakfast (including biscuits and gravy, sausage , eggs and pancakes etc. ) 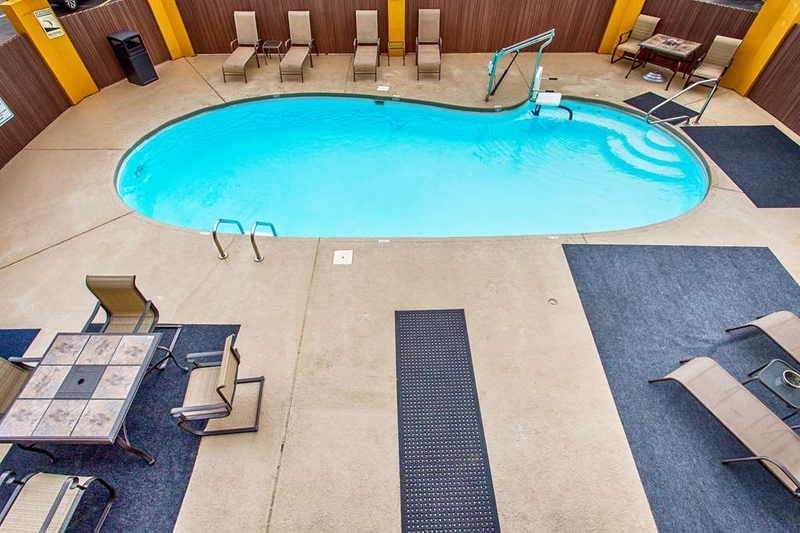 and features an outdoor pool, exercise room, and an onsite laundry facility. 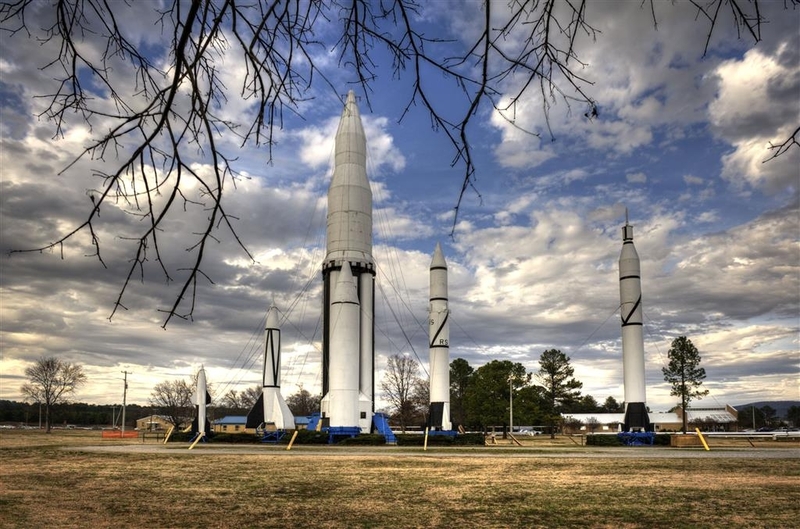 The Best Western Athens Inn is located two miles from historic downtown Athens, AL and a short drive from the Space and Rocket Center Space Museum. Hotel guests can spend the day relaxing at one of the nearby parks such as Point Mallard Park or the Joe Wheeler State Park. Business travelers visiting our Athens, AL hotel will appreciate the close proximity to corporate locations including Steelcase, Delphi and Browns Ferry Nuclear Plant. 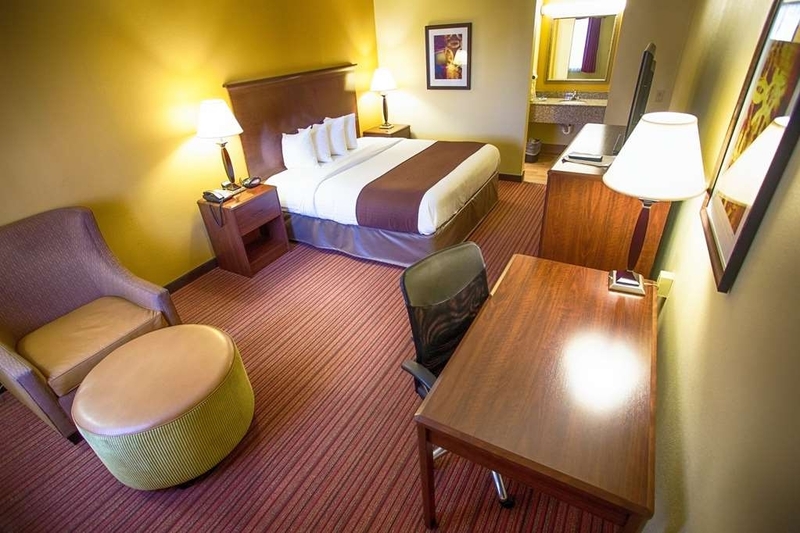 Make an online hotel reservation today and save at the Best Western Athens Inn. When reading reviews, it looked great. Staying here, it's even better. Right off the exit on 65 and across the parking lot from Applebee's, made this a perfect choice. And, CLEAN rooms and nice folks, here, and not a room left, so get reservations online before stopping. Thank you! I stayed here for one night on my way to a conference in New Orleans. (When possible, I prefer to drive rather than fly.) The trip from Ohio southward was a horrible one -- extended delay construction zones, accidents, and maddening traffic -- so when I finally arrived at the motel I was just thrilled to be out of my car. The lady at the front desk was very friendly and efficient. The check-in process took under 5 minutes. The room was clean, updated, and equipped with everything I needed: refrigerator, microwave, ironing board, toiletries, etc. Everything worked well (great water pressure!) and the rate of $124.00 was definitely reasonable. There are many restaurants nearby, including an Applebee's next door, an IHOP a block away, Hardee's across the parking lot, and several others along the main highway, U.S. 72. The only issue I experienced, and this is not the motel's fault, was the traffic noise. But hey, you're along an interstate and a major U.S. highway, I guess there will be noise, huh? No biggie: the a/c unit had a "fan only" setting and that provided some nice white noise to help drown out the traffic. I will add that the only noise I heard was traffic; I didn't hear anything from other rooms or guests. After my conference I'll be headed this way again and may just stop on my way home. "Long day traveling with a small dog"
What a pleasure to walk into a clean, odor-free room. Easy access to Interstate, no-hassle reservation. Just the ticket for a restful night before continuing on our journey. We make the trip from WI to FL every winter and have stayed in some properties that were substandard, but not this one. Unless you require chocolates on your pillow, choose this motel. The toilet flange was broken, the phone did not work but worst of all once in the room the door jammed and could not get out. No phone and a door that would not operate. I called with my cell ...Their response was they would take care of it when we checked out. I said NO! We are trapped send someone now! Also rudest front desk person I have encountered. We apologized for the issues and had them fixed immediately. We understood your frustration and we had refunded your pet fee due to the reservation being a 3rd party. Josh had called you after you had checked out to inform you of the refund. Again we all apologize for any inconveniences you had during your stay. "Great Hotel at a Great Price"
We stayed here for the weekend while attending a class. The price was fantastic and so was the hotel. The rooms were clean and looked like they'd been recently remodeled. The breakfast was on par with the Holiday Inn Express next door, but at half the price. The front desk folks were very friendly and responsive. The bed and bathroom linens were soft and comfortable. The bed was comfy and the shower was great. We will definitely be staying here again. Thank you for the review and we are so pleased you enjoyed your stay with us. We do our best to ensure each guest has a pleasant stay with us. We look forward to seeing you again in the near future. We stayed here on the way to and from Alabama. This is not the quality of a Best Western we are used to. The rooms have doors facing the outside. Only 2 levels and both times we were put on the first floor (assume no king beds on 2nds floor?) even though I always request highest floor. The beds were hard, lots of traffic and the walls are thin. Breakfast was typical. Check in both times took a long time even though we were the only ones checking in the first time and the second stay there were 2 people working the desk but only one was checking people in and there was one couple in front of us and it took longer than usual because she started visiting with them. The area was booked otherwise we would have gone to another hotel on the way home. Would not recommend staying unless they update their beds, even then it would be better to pay more and stay at a hotel in the area that had doors inside. "Overnight stay on my way to Panama City Beach, Florida"
A very decent highway hotel. Great dining options nearby. Similar hot breakfast options to Holiday Inn Express. I've had better coffee than what's on offer here at the brrakfast bar. Overall a great option for overnight stay. Thank you for the review and for staying with us. We hope you will stop in and stay with us again. "My new favorite Best Western!" I stay at multiple Best Westerns for my work and each one has been good but this one in Athens is hands down become my favorite! Although this is an older hotel you really would never know it as it has been refurbished. The best part about traveling with your pets is it has hardwood floors, no carpet!! It is by far the cleanest hotel I have EVER stayed in and I am talking baseboards and vents clean,,,I actually am staying here now during a move to another state. Circumstances have led us to be here now a week instead of a day and I am grateful to have stayed here opposed to anywhere else. Every single staff member here has a good attitude and has been helpful to anything I have needed. Josh who works at the front desk (part of management team?) has the BEST attitude at 7 am then anyone I have met. He really is a stellar employee and I am hoping he will come work for me (: The manager here also is the same, I always see her bouncing around here helping her employees and that right there says a lot . You can tell by the cleanliness and how efficiant the hotel is that she takes great pride in her job and her employees. So if you are traveling this way and trying to make a decision where to stay there is no doubt this is the place. It is inexpensive, pet friendly, smoking or non-smoking rooms, and you can walk to any restraunt you want to eat at in this area (there is literally an Applebees, Ruby Tuesday and IHop basically in each corner of their parking lot. I decided to stay here on my personal time and drove 45 min out of the way straying from my other favorite BW just for the simple fact of how clean this place really is and the rooms are a perfect fit for all of my needs!! Thanks for the awesome stay guys, when we visit this is where we will be staying!! We truly appreciate the review and we will look forward to having you stay with us again. Great hotel for the price. Friendly staff. Great location off the interstate. Older hotel but clean and roomy. Exterior corridors for those who prefer them. Comfortable beds. Pet friendly with plenty of green space. Traveling with the dogs has never been easier. Rooms are great - on ground level, no carpet and specious enough to have two dog beds. Nice walking area for the dogs and quiet and comfortable for us. It's good to know we have a great place to recoup before the rest of our trip south. Stayed one night on the way to Florida For the price this motel was excellent. Room clean and breakfast was ok. Easy access from Highway. Several restaurants nearby. I would stay here again. If in the area. While driving to our Florida destination, we booked a night at this BW along our route. We found the accommodations to be excellent for what we needed, a really good nights rest. The room was very clean and peaceful. Desk staff, enthusiastically, sought to make sure we were taken care of, even accommodating us with a 1st floor room so we could park right by our door. What was the bigger surprise, was the great breakfast they served in the morning! Especially inviting was the fantastic coffee. Hotels generally don't rank high in terms of their coffee with me, a former coffeehouse owner, but they have great coffee and a very good, diverse and hot breakfast. We'll try to come by again, in our future travels to Florida! "Great Price for Value Received"
Great location within walking distance of several restaurants and fast-food spots. Room was above clean and appeared to have been recently updated. Pillows were some of the most comfortable I've ever had. Only slight problem is a lack of outlets at desk and at bedside so it's not easy to charge device or use CPAP machines. Breakfast was more than adequate and well-stocked in a room that was kept neat and clean. Powdered scrambled eggs were disappointing but not all that unusual. Josh was very helpful at check-in and I left thinking I'd gotten more for my money than is often the case. This is by far the worst Best Western I have ever seen. It is obviously a refurbished motel. The deadbolts don't work. But at least the sheets were clean. And don't bother prepaying the pet fee; they will charge you an additional $30 fee regardless. I apologize you didn't enjoy your stay with us. We are an older property but strive to be the best we can be. The issue with the safety latch has been addressed with maintenance and is being repaired. The pet fee is not included with a 3rd party reservation that is at a Hotel level only and 3rd parties cannot charge you at the time the reservation is made. Again I apologize . "asked for corporate discount. did not get it. no bwr offered. slow internet. old rooms with paint of coat." rude at check in. slow internet. showed corporate discount and was told not given went online and it showed I could have gotten it. at least restaurants were in walking distance. won't stay here again. I apologize for the issue at check in and will be speaking with the clerk. I truly apologize your stay wasn't pleasant with us. As we spoke at checkout the clerk did adjust your rate to the corporate rate as requested. It is an easy drive off I-65 with the Best Western close by. The rooms were clean, modestly done, and up-to-date. We were within walking distance to an Applebees who provided 10% off if you were staying at this Best Western. Breakfast was offered at 5am which was helpful for our southern trip ahead. This has been our stop after 644 miles of driving for the past six years. We highly recommend it. Thank you for the review and we hope you stop in and stay with again. Had stayed in a Best Western hotel a couple years ago that we really liked, so decided we'd try another one on our trip to Florida. We were very impressed with our stay, for the price we paid. There are really only two important things we look for in a hotel, a clean room and comfortable bed. Best Western does not disappoint. Thank you for the review and we do our best to make sure each guest has a pleasant stay with us. We enjoy meeting folks from all over the Country and look forward to you stopping in and staying with us again. "Two nights (different stays, different rooms)"
"Nice place at a great price"
This is an old school motel (no inside hallways; all rooms face the outdoors). But it is being nicely updated and well maintained. Our room was spacious. Furniture is bland but bed was super comfy. Was very quiet despite I-65 right outside. Two restaurants real close by (Applebees and Logan). Breakfast was fresh and plentiful. Good job everyone. The Best Western in Athens if very clean and the beds are comfortable. It was very close to restaurants and shopping. Conveniently located by the interstate. I will stay here again on my next trip to Athens. "Pleasant stay- pleasant helpful staff"
Good value, nice clean room and very nice and helpful staff. Breakfast was good with a nice variety and wifi was strong and easy to use. Plus got a 10% discount at Lawler's BBQ by showing room key. I will stay here again. This motel was most likely a Super8. The rooms are quite similar, not up to BW standards. Looks like BW is buying up motels, painting, doing a little remodeling. Saw this in Okeechobee, Fl. By the way the bed matress felt like it came with the original building. We apologize that we didn't meet your standards during your stay with us. We have always been a Best Western. We also just finished renovating in March 2017 , with new furniture, carpet, mattresses, tile, etc. Again I apologize we didn't meet your standards. I drive an Auto Transport truck for a living, and its often difficult to find a good hotel that has tractor trailer truck parking. This hotel not only had great parking for big trucks, but everything about this hotel exceeded my expectations. There are plenty of great restaurants within walking distance to eat at. The friendly staff made us feel like family. Thank you for your review and we truly hope you stop in again and stay with us.
" Blood Out Of A Turnip:)"
I typically don't like staying at Best Westerns, unless it's a Plus or Premier, but we decided to give this one a try. We sifted through the reviews and figured for the price it was worth a shot. We arrived late (2am). Check in was quick and easy and the gentleman helping us was very kind and helpful. When walking in the room, it had a bit of a musty smell, nothing unbearable. The room was very clean and inviting. It could use some touch ups here and there, but overall, it was a nice surprise for a $70 room. It has some updates and everything we needed for our stay. The bed was comfy and the towels were very soft. The pillows are pretty horrible though. But overall for the price, we were pleased with the stay! If you're wanting a cheap place to sleep, give this place a try! My husband's family is in Athens, and we go there once each year. We have been staying at this Best Western for the past 17 years. We have never had a complaint, so we continue to return. It has had some updates over the years and hopefully they will continue. There are 4 restaurants within walking distance. This was a fantastic hotel to stay in to break up our long trip. The room was clean, the bed was comfy, and the shower was hot. The breakfast was great and more than I expected. They had pancakes, biscuits, gravy, sausage, eggs, and assorted fruit, cereal, and muffins. I would definitely recommend this place to families looking for a place to stay on a budget. On our Florida road trips we stay at Best Westerns. No frills, but always clean, no smells, comfortable beds, fast check in. Reasonably priced. Just what we need on for our back n forth Florida road trips. "Rooms liked remodeled very vice"
My family and I stoped here on the way to Gulf Shores. 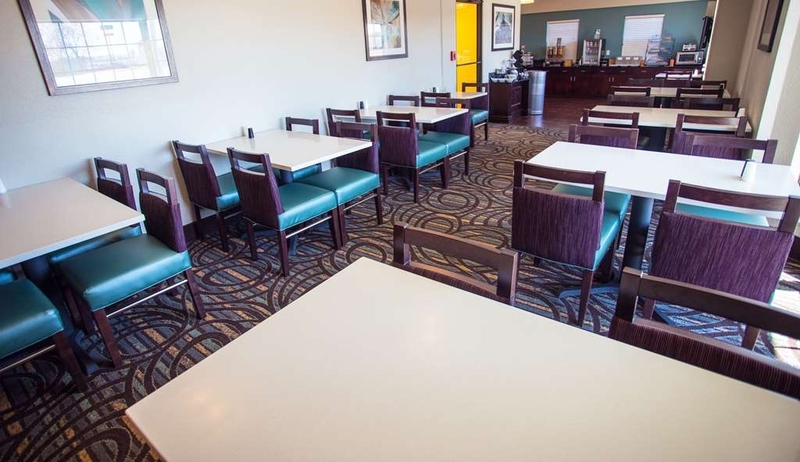 The room was clean, up-to-date, and fairly priced; the staff was very helpful; and the breakfast was good and fresh. The only thing that caused me to drop the rating a bit was that the beds were not very comfortable; they were very hard. Other than the hard beds, this was a very nice stay, and we will definitely consider booking here again! We stopped overnight due to heavy traffic on our way home from Gulf Shores. The room was clean, no musky smell. Bed was comfortable. Close to restaurants. Close to the interstate. Josh checked me in and he was very nice and called to make sure our room was ok and we didn't need anything. We stay again. We stopped here because they had rooms dedicated to travelers with pets. The floor was hard, not carpeted, and the place was very clean with no smells. In other words, it was perfect. There was a simple breakfast included -- not special, but it got us on the road. My two year old, husband, and I stayed here on our way to Panama City during a bad storm. We got in about two a.m. The hotel was very clean, plenty of room, and the bed was very comfortable. A little on the pricey end, but not too bad. Room and air were quiet. Room was clean and well kept. Bathroom was clean. No bugs seen. Pool was small. Great location. Applebees, Logans in the parking lot. Shoney's, Ruby Tuesday and Starbucks very close by. The hotel is right off the exit ramp, easy to find. The room was clean, no issues with the sink or tub draining. Bed was comfortable. No issues with the wifi. Good breakfast in the morning (several hot items, eggs, sausages). The front desk staff was very courteous. Very good room for the price. There are several restaurants nearby within walking distance. "Changed Reservation and Lied to Me"
Made a reservation a week prior to arrival- when I arrived I'm informed the room I reserved was not available because it was given to "in-house" guests- I have no idea what that meant and why they would give my room to someone else. Then she acted like she was going to compensate me for this by discounting my room- but when I get my bill all she did was give me the rate for the room they put me in- as it was a lower rate then the room I reserved! But she gave me a rate that was $5 more than what it would have been if I had reserved it ahead of time- so instead of making it right, they added insult to injury. I stay a lot at BW's but not this one again. Tell me the truth and treat me fairly and I am reasonable to deal with- bit don't lie to me and take advantage of me. Very nice stay clean and comfortable. Great breakfast. Friendly staff. What else do you need on a driving trip stopover. We will use this location every time we travel to the Florida panhandle. Perfect distance between Columbus, Ohio and Destin, Florida. We appreciate the review and for you staying with us here at The Best Western in Athens , Alabama. We are pleased you enjoyed your stay and we do our best to ensure each guest stay is a pleasant one. We will look forward to seeing you again . We stopped for the night on our way to Destin, Florida. Room was nice and clean. Staff were very nice and helpful. Didn't eat breakfast other than juice and yogurt, but selection seemed fine. Only issue was the remote to the television didn't work very well, but didn't matter much to us since we had our tablets and that kept us occupied until we fell asleep. All in all a positive experience. Thank you so much for the review. I apologize about the issue with the remote/TV. We are now installing new TV's and all remotes will be programmed to the TV. I hope you will stop in and stay with us here at The Best Western Athens Inn. This was not one of best hotels for a Best Western, older hotel but our room was clean and bed comfy, staff was great, good for an over night stay, good breakfast plenty of room to eat and move around, all we ask for is clean room and good bed, which was both, would stay again if for an overnight stay.Lady at the front desk when we checked in was super nice! Like the Best Westerns and we usually try to book one when ever we travel if one in the area, but again this one is good for overnight stay. Thank you for the review and we appreciate your business. We look forward to having you stop in and stay with us again. We used to only stay at Best Westerns because they were consistently comfortable and well-appointed. This visit was a disappointment. The parking was extremely limited, the breakfast was barely passable and half the equipment in the fitness was broken. The staff was hard-working and responsive. Honestly, if I had paid $80 or $90 for the room, I would have been pleasantly surprised. But I spent almost as much here as I did on a suite that was 10 minutes from the beach. I want to apologize that your stay with us did not meet your expectations. Unfortunately during peak season parking can become an issue. I will be having our fitness repair company out to fix any issue we have with the equipment. Please email me with the issue with breakfast . We are at brand standards but try to go above to satisfy all all guest . pretty nice place staff very kind and breakfast was one of the best i ever had any where was very happy with all the food items they had and was able to use a coupon from the travel plaza we stopped at in Alabama and saved us some money. We appreciate you staying with us here at Best Western Athens Inn. We do our best to ensure each guest has a plesant stay with us. We will look forward to see you again. 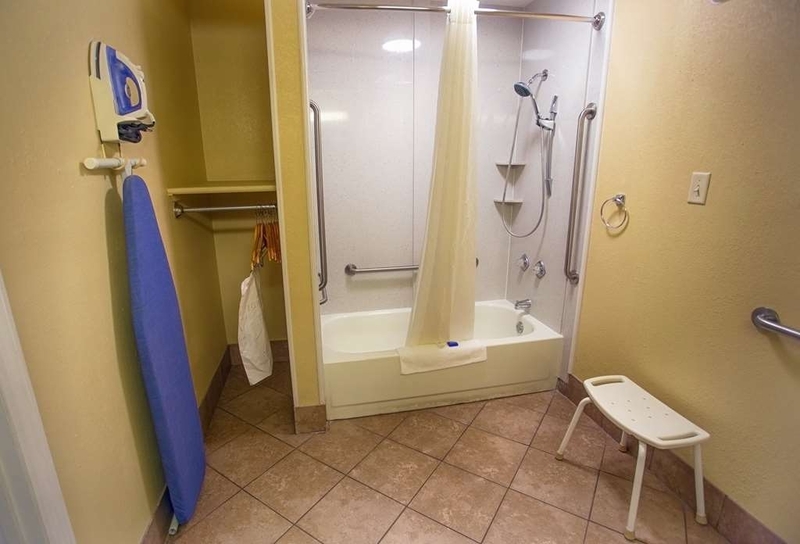 "Very clean location but the shower needs attention.."
The woman checking us in was very nice and accommodating. The lobby and breakfast area was so nice and clean. We booked a King room on the first floor and it was comfortable and very clean. Our only issue was the shower faucet/shower head. Both appeared to be detaching from the shower wall and the shower head had a leak. So it was spraying off to the side when turned on. The water pressure is next to nothing unless you want a cold shower and even then, it almost isn't worth the hassle. Room 132 needs major shower updates! If that hadn't been a problem, I would have given this hotel a 5-star rating. Thank you for the review. I want to apologize for the issue you had with the shower. We have addressed this issue with maintenance to ensure this doesn't happen again. We hope you will stop in and stay with us again in the future. Rooms are clean, The front desk is friendly, The breakfast bar is good, But goes fast. They do not restock the breakfast bar. . Parking is good. Now the bad. You can smell the smoke through the ventilation fan in the bathroom from the other rooms. Getting in and out of the street is not the best. The Hotel should have a weekly rate. The Wifi limitations will not please you. The laundry room is not the best. Stopped for one night on our way south. We had a first floor king room. Friendly staff at check in. Room was clean and comfortable. Nice size. Included two overstuffed chairs and ottoman, plus table and chair. Bed was comfy. Lots of restaurants within walking distance. Hotel located next to interstate but didn't notice hwy noise when trying to sleep. Breakfast was adequate. Breakfast area neat and clean. Would stay here again on our way through. Decent price on the room ($81 incl tax and fees). "Travelling to Panama City Beach"
"Very friendly staff and a clean updated room." I was very happy with my stay this past week. The room was very clean and the staff was very helpful. The breakfast in the morning was excellent. Usually you get only a few choices like cereal and bagels. They however offered cereal bagels, muffins, eggs sausage bacon, biscuits and gravy waffles etc. I will definitely stay here again If Im in the area. "Good location - convenient to many restaurants"
We've stayed here before traveling back and forth to Florida. Like the location "off" the Interstate. Many restaurant nearby "options", 3-4 or more within easy walking distance. All offer a 10-20% discount to BW guests. Nice swimming pool for use in warmer weather. 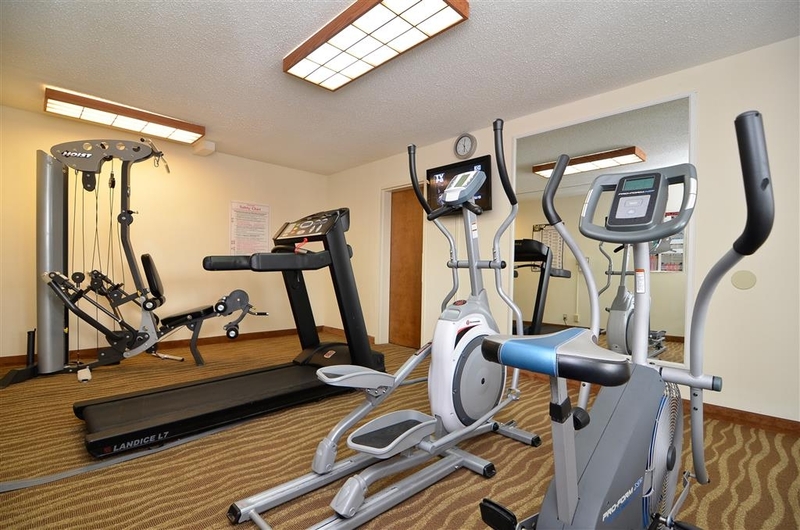 Also, a nice fitness room, free breakfast, PC in lobby for guests plus room WIFI. Thank you for the review . Please let us know when you stay with again how we can improve your stay. This is certainly an older hotel with all exterior doors. The rooms are very tired however the bed was made impeccably. The first room we were in was supposed to be a non-smoking queen room. We were told there were no first-floor rooms available. So we hold our bags up to the second floor. We walk in and it is horrid with smoke. We were meeting friends for dinner so we dropped our stuff and headed out. Upon our return we attempted to air the room out with the fan. at 11:00 PM my asthma was starting to kick in and I requested a different room. They were able to accommodate me with a first floor king size bed. The room smelled fine and the bed was comfortable but the room was very tired. This was the first time we've been to a Best Western since they changed their sign logo. Obviously the quality is not there and we certainly will think long and hard before we ever stay at a Best Western again. I truly apologize for any issues you had during your stay. We are an exterior property and we have just finished renovating the property with new bedding and furniture. Best Western offers different tiers of the Brand. We hope you will try our Best Western again in the future. Value was good. Location was great for restaurants and interstate. Bed was comfortable and plenty of pillows. Very impressed with cleanliness of room. Property was clean and well lighted. Breakfast was ok.
We appreciate you staying with us here in Athens. We hope you will stop in again in the future. This is a freshly painted, clean and comfortable place to stop for the night. We stayed in a queen room which was ADA compliant. The room was clean, the bed comfortable, the wifi very good. The breakfast was ample (scrambled eggs, sausage patties, biscuits/gravy, yogurt, cereal, pancakes, etc.) I can't see complaining about this selection. Even the more expensive motels don't have a whole lot more than this. The breakfast room opened at 5 am, which was nice for the early risers who needed to get on the road. The check in process was fine. The person behind the counter was dealing with a lot, including people in their rooms calling in about faulty tv remotes (just go to the desk, people; why do you make the motel staff come to your room with the new remote?) They were pretty busy that day, but the room did not reflect this, and that's what counts. It was a nice comfy place to sleep after a long long drive escaping below zero temperatures in frigid Wisconsin. We would not hesitate to stay in the Best Western Athens Inn again! Thank you so much for the review. We are pleased you enjoyed your stay and that the staff was on top of things. Thank you also for understanding the challenges that a Guest Service Agent faces everyday. We look forward to seeing you again in the future. "Desk staff has bad attitudes"
Check-in was bad, we were there at 2:45pm and told "it's not 3" They were out of pancake batter and had turned of the ice machines, due to cold. But no mention at check-in or alternatives for ice. Told signs couldn't be computer printed, had to be professionally made. WHAT ??? Should have had ice at front desk for guest. Breakfast lady did a good job and the rest of the staff did well, but desk staff an issue. We travel through, to and from Fl several times a year and will have think about staying here again. Gave service an avg ratting for the rest of the staff. The stop is convenient if one is heading south. The continental breakfast starts at 5 a.m. 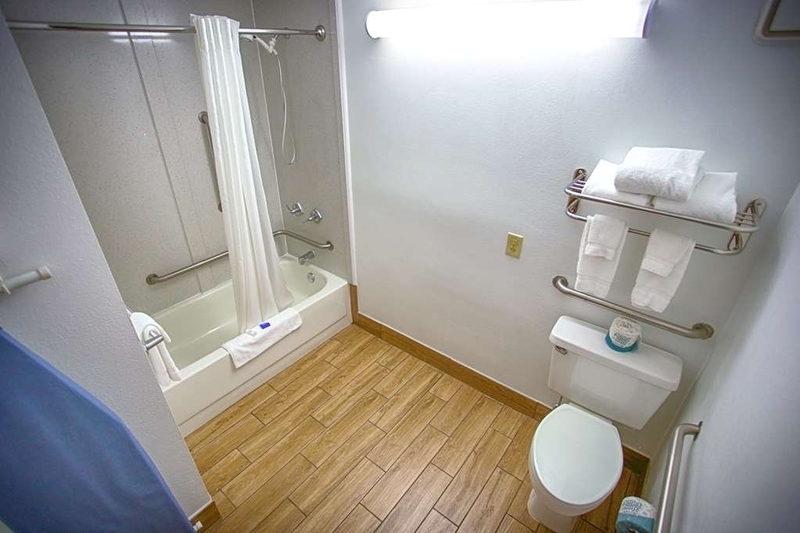 Your stay includes 10% off at Applebees Restaurant There was an update on the hardware at the sink and in the shower in a very comfortable room which includes a desk. Service was great and they even saved me a newspaper. Very nice stay. Everyone was very nice.Breakfast could have had a few more items. Had a lot of different options for Dinner, that were with in walking distance.Was easy to see from the high way and easy to get to. then easy to get back on the high way. I stayed twice at this hotel on my trip to and from Florida. Both times the staff was friendly and efficient and my room was spotless. The bed was comfortable. I ate breakfast both times and the hot breakfast was good and had a good variety of choices. I paid $70 for each stay and that was a great price. Also, the hotel is right off I-65, so there were no issues with finding the hotel or getting back on the interstate. Overall a very good choice and price. I have stayed there on two trips and will stay there again if the opportunity arises. The hotel was dirty. Everything looked old and used. There were bugs all over the room that were over an inch long. The internet was very slow. They quoted me $67.99 per night but ended up paying around $71 plus taxes and fees. I apologize again for any issues you may have had here staying with us. During your 10 day stay with I notice there no mention of bugs in your room to the staff or myself. We had Ecolab go into that room after your previous review and they found nothing. Also the 67.99 was before taxes and I apologize for the misunderstanding. Any issues a guest has we appreciate the feed back at checkout so we can fix any issues. We are an exterior property and just recently remodeled. So I apologize we didn't meet your standards. "Good hotel for the price"
This hotel is very close to other hotels. It is priced better and has similiar qualities to the other nearby hotel. I was happy staying here but cannot offer much as I was just here as a drive through stay over. Did not get to check out amenities but the internet was fine and the bathroom nice. We appreciate the review and happy you enjoyed your stay. We look forward to seeing you again in the future. Hopefully you'll get to checkout out our other amenities when stopping to stay with us. we have been staying here for years and always have been satisfied! clean rooms, well lighted and feeling of safe environment. Nearby restaurants, shopping,etc. Sometimes it is business and sometime leisure. We always look forward to seeing you when you arrive and we are pleased you chose us to stay with when you are in town. Looking forward to your next visit with us. merry Christmas! "Good quality at an affordable price"
Nice clean room, helpful and pleasant staff and very nice free breakfast! Easy access right along the interstate. Room was clean and bed slept nicely after hours of driving! Will stay there again when we come back thru the area! Thank you for the review on Trip Advisor . We are pleased you enjoyed your stay and look forward to seeing you again in the future. My most grateful thanks to Nilda who runs this breakfast area with such professionalism and her natural loving manner to all of the guests. All the food was kept replenished at all times and the area so clean. It was certainly a wonderful stay here. Don't let the dated exterior fool you. Our newly updated room was spacious, clean, and accommodating. The hot breakfast was just what I needed for the long drive ahead. The $20 pet fee was our only mild gripe, but the low price of the room made up for it. Don't spend more at other properties when you can have a similar clean and comfortable room here. "Good place to rest on the road"
"Upgraded my review from 4 to 5 stars "
This is the second time we have stayed at this hotel and it will be the only hotel we stop at when we go to florida (which he do 2 or 3 times a year) I now give it five stars because they are pet friendly and the breakfast.....good selection good quality and it opens at 5 am since we like to be on the road early it's perfect for us....keep up the good work and we look forward to being your guests many time in the future. "Well, The Price Is Right"
We spent one night at the Best Western in Athens. This appears to be an older hotel with some upgrades. Our room was on the back side and on the bottom floor. It was a fairly small room with two queen beds. We started out in one bed, but since we both kept rolling to the middle, we moved to the other bed and it was much better. The bathroom area was adequate, but the toilet kept running all night. I'd say it would run about twice a minute and shut off. We just shut the door and since we were tired it did not bother us. The breakfast is the typical Best Western menu, but there was not fruit at all. This place was ok for one night, but we would not stay there for more than a one night stay. 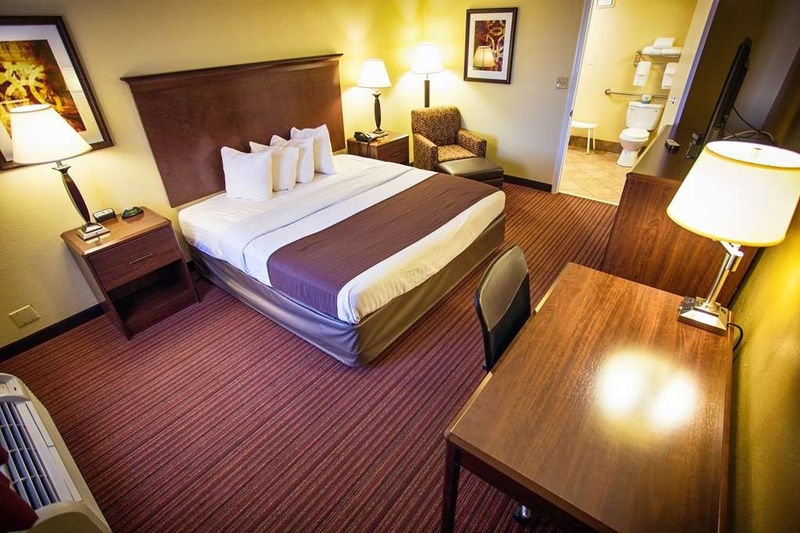 "Our stay in Athens Alabama"
Below average price for a room with a very comfortable bed. My wife and I stayed for four nights while visiting relatives in the area. They also allow pets as do many of the motels in the area. Motel seemed to be full every night. Biggest complaint id that on our second night we were found to be locked out of our room and once we got in there had been no maid service that day. I was told that they made a mistake of thinking were were only staying one night, but that doesn't answer why the room was cleaned up, etc. We were at least given new clean linen. Stopped at this hotel on our way south. Hotel staff was friendly and check in was easy. However when we got to the room, it was in very poor condition. Carpets were dirty, bathroom was not well maintained. Vending machine was an old can pop machine that only took quarters, looked like it was made in the 1970's. Would not recommend. very clean hotel. great price. good breakfast. helpful staff. location is ok, a little out of the way of major highways but easy to get back on. we will stay here again if we get tired on our drive to or from florida's panhandle. Nicely updated hotel. Good breakfast and service. You get your penny's worth here! I would say that in the area, which is Athens, AL, they have a lot of competition and they are up to the challenge! The best value for your dollar is at this particular location. Well worth it! The staff upon registering was very friendly. The bathroom in the room gave the impression of being dirty. Actually, it was a little but nowhere near nasty or anything like that. It looked like they got to a "good enough" stopping point on the remodeling and quit. I had a smoking room and the bathroom fan stayed on all night long. Maybe they all do, I don't do hotels much. When I checked out I had to wait for the lady in the t-shirt (at a BW?) to finish her chatting about nothing with someone else before she gave me her attention long enough to check out. The pancake machine stopped working but they did get it going again. The pancakes were okay, nothing special. Sure wish they'd had the waffle maker instead. The sausage ran out twice and there was hardly anyone in the breakfast room. IF I'D KNOWN upon booking what the experience would be like, I would have definitely stayed another night at the Days Inn down the road and saved a little money. It was actually a better stay (the night before) and breakfast but I'd already booked my second night's stay at BW. I want to apologize that your stay wasn't pleasant . The day in question that I arrived at the hotel with a t-shirt on there was an issue I had to come in and help handle. I normally wear dress clothes to work but this was a weekend I had off. The fan in the bathroom's in the smoking rooms do run constantly due to this being a smoking room. Also the pancake machine has been replaced due to issues with the existing one. We stopped here on a road trip. The staff was the friendliest of our entire vacation! Pros: Comfortable bed, ease to park near room, Large chair/ottoman in King room, large vanity, good coffee. Cons: Felt like it was still in remodeling mode... some new items/some cracks/unpainted areas. TV/remote were older style, OLD faucets which made it either scalding hot water or lukewarm. "Nice stop for the night"
Need a place to rest for the night while traveling this is a place to look into. Value wise it is very good and breakfast is not bad either. Bed was average and decor was slightly run down ,but for a stopover it is a good place to stay. This hotel meets and exceeds the Best Western standards. While it is not a Plus many aspects would meet those standards. Check in was effortless. I am glad the Best Western policy is to confirm identity by looking at the drivers license. The rooms are clean and spacious. Shower is in a separate room from the vanity. Very convenient. The desk is large and well lit. Breakfast was excellent and what you have come to expect. The breakfast area was kept clean and stocked. "Nice Stay, Good Rate, Free Breakfast"
Our room was nice and clean. Beds were comfortable. Check out was quick and easy. Breakfast was good but busy and couldn't find a place to sit when we first came. The only complaint I have is our room smelled smoky even though it was a smoke-free room. We had to air it out. "For Overnight on a Road Trip -- We would definitely stay here again!" We enjoyed our overnight stay at this hotel during our Road Trip from Florida and can recommend it to other travelers. 1. Bed – Great – very comfortable after a long day on the road 2. Cleanliness – Excellent 3. Quiet – Excellent 4. Size of the room – Excellent 5. The Internet worked perfectly 6. Breakfast – Loved that they had the automatic pancake machine – even though it was having a few hiccups – and the sausage was very good! This well-cared-for 2 star hotel is old skool and the room was “dark” but the renovations were nice and appreciated. We would definitely stay here again! We stayed here for one night on our way home from vacation. We had a non smoking king room on the ground floor. The room was clean, comfortable bed, nice decor, quiet, perfect air conditioning, super nice shower with shelves and grab bar. Nice breakfast. Easy and smooth check in and out. Ruby Tuesday restaurant next door that gives a 10% discount for BW guests. The hotel is just seconds off of I 65. This is the nicest Best Western motel we have stayed in. I give it 5 stars! A bit of a challenge to find a clean, affordable dog-friendly hotel but we did. I haven't stayed at this type of hotel for years but it was clean, recently updated and so affordable. Free wifi and breakfast and a nice little pool. The staff was friendly too. Located just off I-65, it couldn't have been more convenient. For the type of "hotel" this is, it deserves a 5* rating. "Great staff & customer service!!!" We booked last minute for a business trip for our workers! The staff was incredibly friendly and helpful!! They went above and beyond for us with booking our rooms! I would highly recommended this hotel to anyone!! Thank you for the wonderful review. We always do our best to assist and accommodate all our guest the best of our ability. We hope to see you again in the future. My husband and I stayed overnight here on our way down to Gulf Shores. Room was nice and clean, bed was comfortable and the free breakfast was good. It has scrambled eggs, sausage, biscuts & gravy, pancakes, cereal, bagels and muffins. There is an out door pool but we never used it. Also, there are a lot of restaurants and if you mention you are staying at the Best Western you get 10% discount. Thank you for the review and we are so glad you enjoyed your stay with us and hope to see you again. stayed there on a wed. nite and got a great rate. guy at the front desk was friendly and got us our room quickly. don't remember his name but he was a young guy with longer hair. its right next to an applebees and a hardees so you have a dinner choice. breakfast was very good with everything you could possibly want and the dining area was very clean. Thank you for stay with us here in Athens at the Best Western. The clerks name is Kevin and he's a great guest service agent. We hope you will stop in and stay with us again. "Cant beat the price and location"
You will be hard pressed to beat this hotel for the price. I often travel from my home in Florida to my hometown in the midwest, I travel with my dog and its hard to find a good, pet friendly, hotels in the south. I found this little gem on Bringfido.com. The reviews were spot on. Obviously its not the Ritz Carlton but it is clean, modern, the staff is friendly and sits right off the interstate. Also 3 restaurants within walking distance which is really nice. This place will continue to get my business when I travel back and forth from Florida to the midwest. We are glad that you found us! We do our best at accommodating all our guest to the best of our ability. We're pleased you will be stopping in to see us again. "Stop over for the night"
I apologize we don't have the waffle maker we choose the pancake machine instead due to the layout of our breakfast bar before we renovated. We are glad you enjoyed the rest of what we had to offer at breakfast and we hope you will stop in and stay with us again. Quick stay for leisure. The attendant at check in was very nice and got us to our room quickly. It was a last minute reservation but we were provided a very nice room. The hotel is within walking distance to several restaurants which is convenient. We booked this hotel last minute to stay at on our drive home. We were looking for an inexpensive hotel close to the highway. We were very satisfied with the price and cleanliness of this hotel. I would recommend it if in the area. Nice room, clean, refrigerator, coffee maker and microwave very useful. Workout room is clean and has tv and tredmill which I use every time I stay. Staff is helpful and nice. Exterior and Interior nicely decorated and comfortable. Thank you for the review and we are glad you like the changes we have made with the last year. We hope to see you again soon. Our company stays here regularly. The staff is pleasant, the rooms clean, and the area convient. Internet is about average speed, the pool while small is clean and well maintained. Beds are comfortable. Showers have ample pressure and the temp is high enough for my taste. Booked this one based on reviews. Room was not very clean. There ants in the bed. We were put in a handicapped room. The refrigerator was up against the bed. The staff wasn't helpful or caring. When told about the problems with the room all I got was ok. I apologize for the issues you had during your stay. Being an exterior property it is hard to keep every insect out of the rooms. Ecolab comes every month to check any issues that any of our guest have had. As for the location of the refrigerator during renovations that was the only place that was available so a wheelchair can move in-between the bed and chest. When booking a room we only see the room type you have booked and place the accordingly. Depending on the day of arrival we sometimes can move the guest but only if the Hotel is not full that night. No complaints here. Room was perfect and clean. Wifi was fast and perfect for business work. Breakfast was hot and fresh. Very friendly. Another perk is that the hotel is centrally located around several restaurants. Never gonna struggle finding somewhere to eat! This is the finest Best Western I have stayed in. All are usually good but this one is above the rest. The breakfast bar was the cleanest and best laid out of all I had see on this week-long trip. It was convenient to the Interstate with a nice restaurant close by. I have stayed at this one four times now and each time it is better and more enjoyable. "Nice place and great breakfast"
Very clean room and easy access from the highway. Wonderful free breakfast with omelets, sausage and biscuits. Our room was quiet and very large. No smell of smoke at all. The pool looked clean and pleasant. Excellent place for a stay right off Hwy I 65. Lots of restaurants and gas stations to choose from. Very super clean and comfortable beds and wonderful hotel staff. Well lighted and an excellent breakfast.Very reasonable rate. We stayed here 1 night while traveling to Gulf Shores. Location was perfect! Room was very clean, staff was awesome and the free breakfast was good. We liked it enough that we rebooked the same room for our return trip home. Easy access, nice accommodation. Appreciated being able to have pets in room with hard surface floors (vs icky carpet!) Room was clean (floor seemed a bit dirty when i wiped up water drops around dogs water bowl-but not sure how clean a floor can get when cleaned between stays. It looked clean and was free of any hair or debris). Chair and bench were clean and spot free. Linens not luxurious but clean and very adequate-especially for the price. Appreciated ground floor availability for access to walk dogs. Also, area where i'm sure people walk their dogs was free of droppings-which was likely due to diligence of hotel staff, not consideration of other dog owners! Overall very good room experience and pleasant front desk staff. They do a very good job and are a friendly group. Good location and the hotel was very clean. It has a lot of restaurants near and it's right off the interstate. Price is ok for the area, always nice when it lower. We booked this hotel based on its high Trip Advisor reviews, but would not stay! The hotel has NO interior corridors. It has NO elevator. People were loitering on the exterior steps and walkways. I did not feel safe. Instead we went to the Holiday Inn Express next door. This was our first major Trip Advisor disappointment after relying on recommendations to locate hotels on a 5 week driving trip in the USA. Mercifully, the young man at Reception cancelled our reservation without any fuss. Thank you for staying with us. I apologize our breakfast only goes to 9 Am that is due to it starting at 6 am for those travelers who want to get on the road mush earlier. But we do offer a Grab and Go breakfast at the front desk. "Very Good Stay with pets." Very clean. No smells. And it was a pet room. I especially like that the room was tile, NOT carpet. I wish all hotels would do that. Also located to good food and right next to the interstate. I give this hotel 10's across the board. Thank you for the great review ! When we renovated it was a good decision to not put carpet back in the pet rooms because it is easier to clean and maintain. We look forward to seeing you again in the future. "Even their Maintenance man takes pride!!" Nice and clean well appointed hotel, super good folks, great breakfast with employees (even the maintenance man went the extra mile to assist!) that care for your comfort with pride! I almost skipped this hotel as the rates simply seemed to low...Glad I didn't ! This will be my future place of choice when business calls me back to Huntsville. This is the best hotel to stay if your in Athens Al. I have stayed here every 6-7 weeks for the last 2 years and never been disappointed. 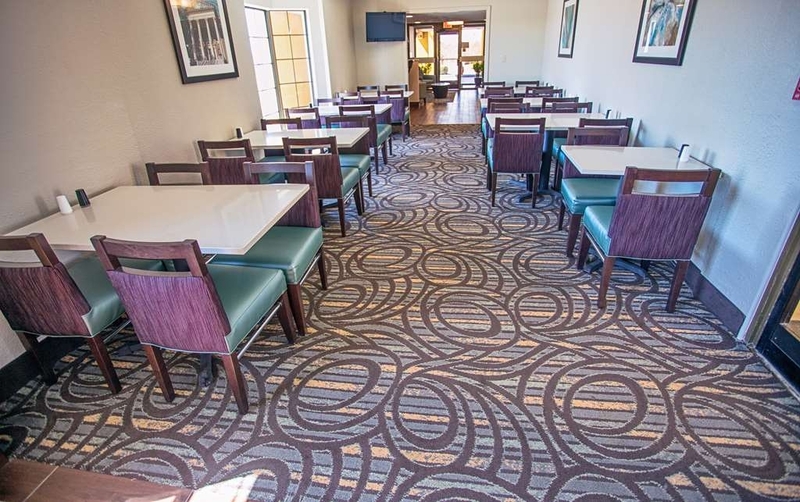 Access to the highway is a breeze, and you can walk next door to a few chain restaurants like Applebee's, Ruby Tuesday and others for diner or lunch. The rooms are clean and comfortable. Breakfast has many options like cheese omelets, sausage , pancakes, cereal, pastries, and of course coffee, juice and fruit. They have a computer you can use and you can get a copy of the daily USA paper. Can't go wrong here. This hotel is very close to I65, next door to an Applebee's for food and drink. Hotel room was clean and nice, rooms and amenities all seem new in rooms. Outstanding breakfast in the morning closes @9am. Workout room is very small with limited equipment but it was adequate. The staff was salty and looked mad that you are there. I will stay again if I'm near. Thank you for the review on Trip Advisor. I will be addressing the look and attitude of the staff upon your arrival as this is not how we operate. But I am glad you will stay with us again if and when you are in the area. The front desk staff was extremely friendly and helpful. The reservationist when I called to reserve room was able to place me in a room on the ground floor near the office. I am a senior citizen traveling alone and appreciated this. My room was clean and comfortable. The breakfast was excellent. I highly recommend this property! I am glad you enjoyed your stay. With our guest that are traveling alone we try to ensure they are on a ground floor and near the office. We understand that traveling alone can be unnerving when staying in a hotel alone. We look forward to seeing you again in the future. I do a lot of traveling, love the rewards program. The room had some issues,but tolerable.The toilet was broken and the door plate was coming off the door. Location is In a very convenient area, close to a lot of restaurants. Pool was nice. Would use this location again. We appreciate your business and being loyal to the Best Western Brand. We have addressed the issue in the room. We appreciate our guest informing us of any issues they had so we can correct them. We look forward to seeing you in the future. "Nice place to stop for the night"
I never have any problems at this hotel-great place to stay. I recommend it highly to any travelers passing through North Alabama. The rooms are very nice-great bed, air conditioning, shower and TV as well. "A jewel in the rough"
Excellent value for the price paid. Very attentive desk staff, both night and morning. Wifi wasn't pokey, and while I didn't eat the breakfast, I liked what I saw. Plenty of restaurants in the area, and it's clean. Would definitely stay here again. Best western athens is a frequent stop for me while working at brownsferry. The Wi-Fi is good and there is a semi truck parking near by for our truck and trailer. Breakfast ain't bad and there is a Applebee next door. Thank you for the review on Trip Advisor. We always look forward to our TVA regulars when you arrive. Next time your staying with us let me know how we could improve breakfast. "Great stay for the price"
Went for a wedding and had to stay 2 night. Great service. Very impressed with the room at how spacious it was and how comfortable the beds were. The bathroom was enormous! Plenty of space to put our luggage. Would definitely stay again if we had to stay overnight in the area. We want to thank you for the good response here on Trip Advisor. It's always help full when guest respond to let us know how their stay was. We hope to see you again in the future. Everything was perfect, great price, clean room and great breakfast. Staff was very friendly and the place was very comfortable and quiet. I would suggest that anyone should be comfortable here. Just off the interstate. "Very nice stay with many restaurants in walking distance"
Very nice hotel. The check in was very quick with a very friendly desk associate. She checked me in quickly and told me of the restaurants in the area that would give me a 10 percent discount by showing my Best Western room card. I had an accessible room, so my room may be very different from a standard room. The room was very clean, and had a microwave oven and a large refrigerator. The beds were very comfortable. 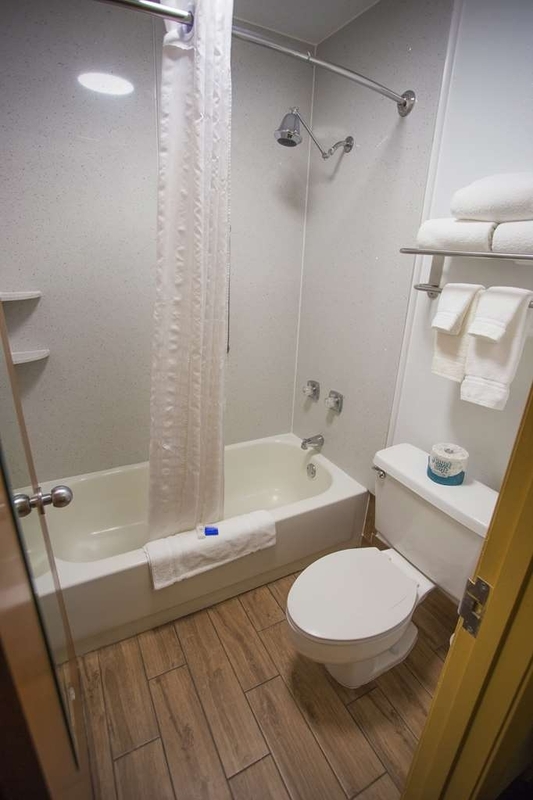 With the accessible room, the bathroom is probably different from a standard bathroom.. The bathroom was huge. There was a lot of counter space, and of course the counter was low for wheelchair accessibility. The shower had an adjustable shower head. There are many restaurants in walking distance. Applebees is next door and several others are across a not busy street. Very good choice. "Overnight stay to thunder beach"
Group of us stopped for the night on our way to Panama City beach. Nice stop over. The girl at the front desk was very nice. On the way Back home stop there again for the night the girl at the front desk wasn't that nice as the first night we stayed there. The room we had the second time we stayed one of the beds was broken down in the middle. No sleep that night. But overall i would recommend it. Thank you for the Trip Advisor response. I apologize about the desk clerk , I informed them all you are the front line of the Hotel.....you are the1st impression. Thank you for letting me know. The place was very dirty. One room in our group had hair all over the bed upon arrival. One room had pet urine all over the rugs. The floor was extremely filthy. All of our socks were stained with filth. Overall experience was bad. I apologize about this issue. This is not how we do things here I assure you. I have had a meeting with the staff and informed them of the issues that were found in the rooms and it's unacceptable. We have a new team and are working hard to ensure EVERY room is clean for the incoming guest. Thank you for letting me know of the issues you had so we can be sure to get this corrected. "Pet friendly Hotel off of interstate 65." I stayed here as it is a pet friendly hotel. I was just making a night stop halfway. The hotels rooms are on the outside which made it easy for me to park my car right in front of the room and unload and load. I asked for a room in the front ground floor as these were outside rooms but the pet-friendly rooms are in the back. There was not really a place to walk the dog . The room itself was pretty clean and had hardwood floors which is nice with a pet. The shower was nice and the bathroom and sink area was clean. I wipe down every room I stay in the remote control, the switches, etc and they had not been wiped. The bed was not extremely comfortable. The bed sheet had been patched . The furnishings were a little shabby and tired-looking. Their curtains were extremely dirty I did not eat the breakfast the next morning but it appeared to be a pretty good breakfast and the area was very clean. What bothered me is that I left my cooler in the room refrigerator and when I called the next day to ask that they send it to me it was a small expandable cooler that I could carry on my shoulder. They had not found the cooler. The man at the desk said he would check around but called back and said that it had not been found. It was not the type of cooler that would be thrown away as it was llike a purse. The corporate office had also sent me a survey so I asked about the cooler during the survey and they also said they had checked and could not find it. For that reason I would not stay there again. Terrific location off the I65! Immediately of the exit. Room was of a good size - well appointed. Lots of restaurants close by. Staff was pleasant and very helpful. Very clean and the bed was comfortable. Would stay again!! This facility is trying to update but is not there as yet. The room was ok but still a little shabby. We had two rooms and the door wouldn't close on one of them. It took 30 minutes to finally get moved to a different room. There was only one person working and she was very busy. Definitely understaffed. The Internet was terrible. The breakfast was just ok. There were bars on the vending machines which did not give us a warm & fuzzy feeling. We probably would not stay here again unless we were desperate. I apologize your stay wasn't pleasant with us. We did fix the issue with the room door that night,door sweep was hung. There are times when only 1 clerk will be on duty due to the low arrivals for the day. The vending machines are serviced weekly , being an exterior property they are selective about what is put in the machines due to the weather conditions during that time. This hotel seems to be old and tired, however the beds and bedding were clean and comfortable. Some things had been updated, but it was still tired looking. We stayed here on our way to Destin, Florida. The price was less expensive than the other hotels at that exit. "So So Service and high price but Nice bedding "
Reasonably Clean and nice bedding. Front desk folks could be more friendly. Multiple items not filled for breakfast. Price too high for a motel in a small town. Everything worked in room. Friends that had another room had a non working tv. "You are not safe here!" Too many violations to list; I would never stay at this location nor any other Best Western. If you value your safety, do not stay at this hotel, especially if you are a single female. The personnel were insensitive to the harm they caused me. "overnight stop on the drive to Gulf Shores"
Very nice clean rooms. Very much recommend. I stay in hotels around 100 times per year and this one is nice and the price is reasonable. Breakfast was average of a motel but overall was hot and fresh. We have stayed here many times in the past on our way to Florida. It has been a good while since we have stayed here and it was our first time since the remodel. The improvements are great and the room was clean. We were able to bring our pets, which was great. The complimentary breakfast was good with many selections to choose from. Our only drawback was our room had a very strong smoke smell. I believe the pet friendly rooms are also the smoking rooms so this is understandable. Overall we were very pleased with our stay and would definitely stay here on our way through again. Finally sat down to write review. Stayed for three wks. at Best Western Athens.My Husband worked at TVA this motel was close to job. My husband works around the country, usually his job last 4-6 wks so I really get to meet the staff and all the people that clean the rooms and take care of the property. I can honestly say that this motel was the cleanest and most friendlyest place I stayed at. The staff and all the workers were wonderful. Would recommend Best Western Athens Alabama. We booked t his hotel because it was close to our destination and was very pleased with the choice. The hotel is near the interstate and easy to find. We were close restaurants and were even given a discount at several. "New clean rooms and lobby....Great!" Spent one night here on our way back from New Orleans to Indy. Rooms were super clean and quiet. Great black out curtains insured a great sleep. Beds were comfortable and nice clean bathrooms. Breakfast was great...not just continental but full service offerings that were quality. Will definitely make this one of our regular road trip stops. We reserved a room with Jennifer requesting king non smoking first floor with a cc via cell phone while on road that early aft(2:00) Arrived at 5:10 and was told no reservation and only doubles on second floor! I was a bit upset and asked where my reservation might be ..JOSEPH informed he had no idea and did I want the room or not? I said what I would really like is an apology and his reply!! "WHY SHOULD I APOLOGIZE? I DIDNT DO ANYTHING WRONG!" And he was so serious when saying it!! So needless to say we left and won't return. BW has sent an email apologizing. We stopped here for the night on the way to Florida. It was very clean and the staff was very friendly. It will be my go to hotel from now on when we are road tripping to Florida. The free breakfast was also much better than most. Thanks again! "Driving to Gulf Shores, Alabama"
Perfect stopping point on trip from Indiana to Gulf Shores. Clean rooms, quiet, good breakfast. Russell Stover just down road for you chocolate lovers. Several eating places close by. Huntsville Space Center not far for a side trip. I recently stayed the other week while on business. There isn't anything unusual to report about this place, so this review will be boring and short. Clean rooms, friendly staff, and your complimentary breakfast, though I didn't try it. The plus to this hotel is that you can show your room key at several of the nearby restaurants and get a discount. Give this place a try, you have nothing to lose. Boom! Found this hotel on our way driving from Cleveland to Metairie, Louisiana. It was great! Comfortable, affordable, and friendly. 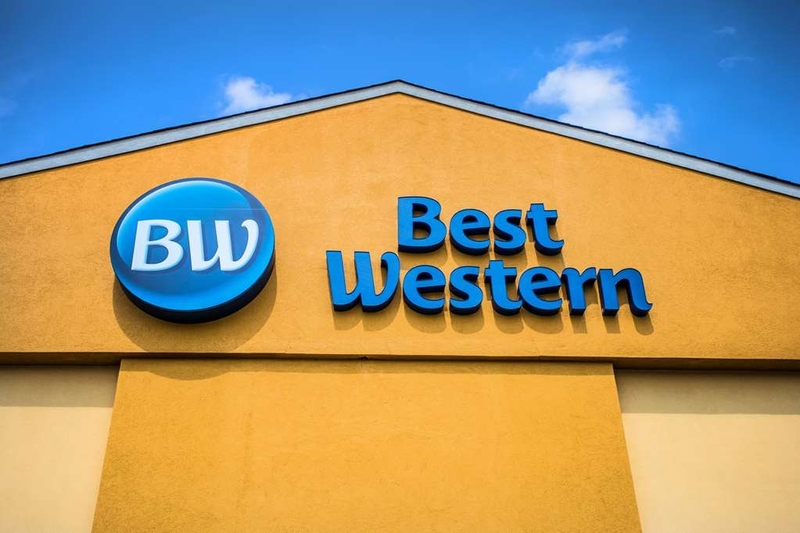 So pleased with Best Western that we joined their Loyalty Program and then stayed at Best Westerns in Metairie, LA and Bowling Green, KY. Fast internet, good breakfast, and very helpful staff. "Good Place to Stay in Athens"
Nice place to stay in Athens, near the interstate. Room was clean and in good working order. Bed was comfortable. Breakfast was good and food and drink was kept stocked. Will stay here again when we are in Athens, AL. Stop The staff was very friendly.at Best Western in Athens, Al on our way to Gulf Shores, AL. The hotel was nice, clean, and had a great breakfast selection. The had pancakes, biscuits & sausage gravy, sausage links which were outstanding, scrambled eggs, pastry, hot and cold cereal. The only thing that we had difficulty with was their WiFi. The staff was very friendly. I would recommend this hotel. We had a very nice clean room and the breakfast before driving the next day was excellent. We have stayed at Best Western before, but the quality of this hotel and its staff was outstanding. Very convenient for a bite to eat the night we arrived. "Wonderful Staff & Newly Remodeled!!" This hotel is one of the best EVER in the family affordable category of hotels! It's been a while since I stayed at a Best Western, but we were tired of driving, needed a hotel that was pet friendly, & this one got good reviews. All they had left was a room with two doubles, but we took it. I figured if it was clean & had a bed, it would do. Well! I knew as soon as we walked in the seasonally scented & tastefully decorated lobby that this hotel was more than just a clean bed! To the left of the check-in desk was hot coffee with REAL creamer (and not just that powdered crap, as my husband said), and to the right of the desk was an iced water cooler complete with fresh lemons. I suppose I'm somewhat of a hotel snob because I ADORE staying in famous/historic hotels when we can, & I LOVE all the little extra things most of them do to make you feel welcome. Best Western Athens Inn is that kind of place. The young lady working the desk that night was friendly, helpful, & made us feel right at home. It was obvious that she was proud to work for Athens Inn & was happy to be there. Every staff member we met was the same! Remarkable! I can't say that all of those qualities have been evident in some of my "bathrobe hotels." In addition to the marvelous staff, the hotel has been newly renovated--including granite tub/shower walls & lovely, non-carpet flooring in the rooms. Fresh & clean. Also, the complementary FULL breakfast was one of the best we've ever had at this type hotel. Any negatives? There is a $20 pet fee, which is not unreasonable, and it was well worth it. Thank you for a lovely experience!! "Great hotel, great price and great southern hospitality"
"Getting older, so travel days are shorter"
This hotel was what we were expecting for a stop over at the half way point of our trip...nothing fancy, but clean and located near good restaurants. The staff was very courteous and friendly. The breakfast was good. If we ever go through Athens, AL again and need a place to stay, we would certainly stay here. We were traveling with friends to Florida and pulled in here to spend the night. The price was very reasonable, clean and a very nice complimentary breakfast. Alisha was at the desk when we checked in. Very helpful. Would stay here again. Maintenance man entered room without knocking while wife was dressing. No electric outlet at work desk. Breakfast was so-so, parking for car w/trailer is not so good about 300 yards from room. Might train the night clerk in expressing friendly personality. Staff was very pleasant to talk to and helpful is giving directions to vacation sites. They were always willing and available to assist you in your needs. The breakfast area was well-laid out. The rooms were easy to get to and were quiet for sleeping. "Friendly Helpful Staff and Pet Friendly"
Finding a nice pet friendly hotel can sometimes be a challenge. On a recent trip we traveled through Athens and I was not familiar with the area so checked the internet for dog friendly hotels. Their website said that they had a limited number of pet friendly rooms so I called them to be sure there was one available before I booked online. The young man who answered the phone was very helpful and told me which rooms he had available and how to check the website to know which rooms were pet friendly. I had not noticed this when I first looked so appreciated his help. Upon our arrival the desk clerk was friendly and efficient and the check in process quick and easy. The young man who checked us in gave us the names several restaurants in the immediate vicinity that gave a 10% discount for hotel guests. Our room was neat, clean, well appointed and had a microwave and fridge. The beds and pillows were comfortable and the towels were soft and fluffy. We really appreciated the fact that the floors were laminate in this pet friendly room. Many times when you stay in a pet friendly hotel the carpet smells like wet dog so having laminate floors in the pet friendly rooms at this hotel was a real bonus. We also appreciated that fact that the rooms opened to the outside which makes it much easier when you are traveling with a dog. Another bonus was an Applebee's restaurant right across from our room which made it easy for us to order a nice hot meal to eat in our room. The morning breakfast was very nice with many options including fresh fruit, yogurt, cereal,pancakes, eggs, sausage, sausage gravy, pastry, muffins, juice and lots of other things. The breakfast room was clean and someone checked it twice during the time I was eating to be sure everything was in order. When I checked out the two people as the desk were very friendly and helpful answering my questions about local routes I was unfamiliar with. Every aspect of our stay was positive and we certainly will stay there again if we travel through that area. "Great room! And pet friendly??" Our room was super clean. Bed were comfy. They had a good breakfast too. Loved the laminate floors in our room . No carpet!There was an Applebee's right out the door. Best of all we got to take our furry friend with us ! Thanks! "Decent room , rude staff"
Older hotel but they have updated the paint and carpet in the rooms. There was an odd smell in our room, we weren't sure what that was. The bed was comfortable, breakfast was good. We did not like the fact that the rooms are entered from the outside. We like the security of inside entrances. The staff was the worst part of this stay. The check in clerk, Alesha I think, was so rude. When asked about local restaurants she replied, " I'm not from this city"....... Ok? You don't eat here? She spoke at us instead of speaking to us. The employee in charge of the breakfast area never smiled or spoke to anyone All she could do was shake her head and roll her eyes anytime she had to clean something up. An elderly couple accidentally overfilled their coffee and it got on the floor, she looked at them, rolled her eyes and wiped it up. We will not be returning based on the staff alone. I stay at this Best Western every year. My family has a family reunion in Decatur Alabama every year. This Best Western is the cleanest hotel I've ever stayed at. And while the faces may change yearly at check-in/check-out, the service is always outstanding. They employ the correct persons for this job. Great place to stay and the staff goes above and beyond to make sure your stay is comfortable.We stay here every year on our way to gulf shores Alabama never had any problems.The staff is very friendly and it is not loud like most places I have stayed. We were moving from Louisiana and arrived very late in the evening. Not only was the clerk very sweet, but the room was wonderful! Clean, comfortable, and excellent after a long drive. We have stayed at this location before, and we'll continue to use this as our "half way" stopping point. The staff made the stay and the room was exceptionally clean and well appointed. The breakfast lay out was also well accepted. Hot food, nothing cold and the whole place was very well kept! The prior night I stayed at a hotel across the street, great price (I thought) but between the spiders, smell, etc. The $ 16.00 more I spent at Best Western was the best $ 16.00 I've spent in a long time. Stay at the Best Western you will be happy you did! Quality Hotel priced fair and quiet clean rooms. Room had comfortable beds and real clean linens. Rooms had a modern look and we fresh and bright. Breakfast was surprisingly good and they had a great selection of food items. Pool was clean,kid friendly and relaxing after a long day on the road. Hotel was located near restaurants and the interstate and you could walk to them. Staff was friendly and knowledgeable about the area. Would stay again if in the area..
We stayed at two Best Westerns on our trip and were very pleased with both locations. The staff was very friendly and the full breakfasts were very good. The overall appearance of the hotel and room was very satisfactory. We will stay at Best Western in the future when possible when traveling. "Good hotel nice area off I-65"
Was a great price for the room we had, just remodeled inside the rooms. Had a good nights sleep and located with dinning close by. Breakfast was also great had a great meal, all the food we like to eat, would stay again. "Ok room, missed the pool"
We had excellent service when we 1st checked in.we. got to check in early. The pool was out for 3 days. We were a bit disappointed as it was very hot and we were looking forward to some pool time. The bathroom was huge and this was great. The shower was a mounted handheld which was hard to angle into tub if wanting to use as a shower. Weight machine in the fitness room was also out of service. The breakfast was a great assortment and the lady who took care of it kept it full and was very attentive. She had a smile for us every morning. Great place to stop- many restaurants nearby. The Hotel is always clean and the bed are comfortable. The breakfast had a nice variety. The pool is clean. The only issue is that we had some pretty slow wifi. I stayed overnight on a business trip. 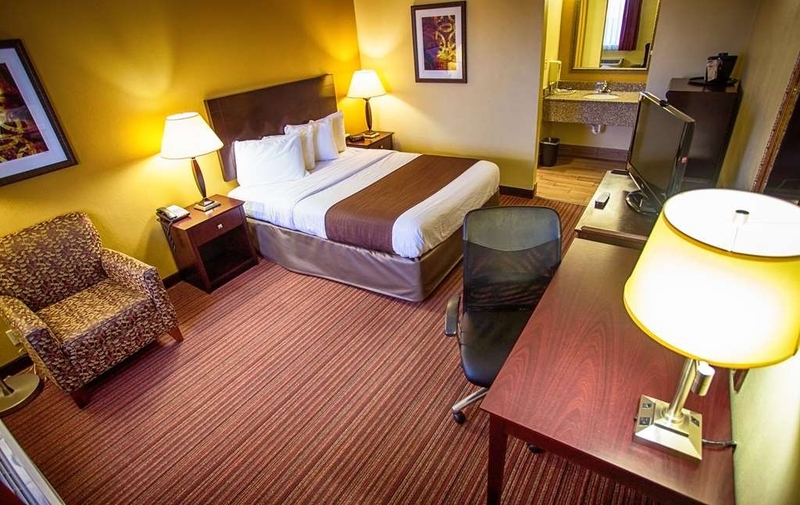 The room had recently been remodeled and was clean and comfortable. The staff was friendly and there are plenty of restaurants close by. I will definitely stay here again next time I'm in the area. We needed a break on a long road trip and decided to stay here based off the reviews. I was a bit skeptical as it didn't have that much outside appeal (looked old and was the old-style motel), but we had an infant and dog so were desperate. Previously we had stayed at a LaQuinta and it was a HORRIBLE experience This was the opposite experience. I was surprised how modern, clean, and updated the rooms were- very lovely! It was so quiet, no barking dogs or slamming doors so we slept great. The staff were all extremely friendly and helpful and the breakfast was another surprise- as it was delicious and so well- presented. All in all, we were very pleasantly surprised at how nice our stay was consideing how cheap this place was... also we love that you can bring your dog with no issues. We would definitely stay here again and have now become BW fans. We are on our way from Florida to Wisconsin and stopped here for the night. Very friendly staff and great CLEAN rooms! Very quiet and very reasonable rates. The breakfast was awesome. We will stay here again if ever in the area! "Way better than we expected "
We are rewards members and did know that Best Western is improving all of their properties so when searching for a place to stop on our way back we decided to stay here. It was after midnight and we noticed this appeared to be one of their older properties which worried us but it was noted as a Best Western Plus which should indicate that it has been remodeled. We were right. Don't let the style of the building detour you from staying here. We were greeted by a very pleasant young man that provided us with a speedy and friendly check in. We got to the room to find a completely remodeled room. Everything was clean and updated. The pool was very desirable as well. My only suggestion would be to extend the continental breakfast hours a bit. We did miss it. Thanks for a great stay. We will be searching for a "plus" when booking our stays in the future. "Comfy beds and really clean "
Our room was really clean and nice. Beds were really comfy and pillows were awesome! It was a pretty quite night even though the hotel was booked , we didn't hear anything. I would stay there again. Great price for the value! I was expecting way less since it was so cheap! But it was really a nice place to stay. After a six day, five night trip to the Fort Walton Beach area, we had our best experience with a hotel, here. Terrific staff and the rooms and amenities were well above the balance of the trip. Two thumbs up! Stayed here last week. You guys saved our trip. We had checked into another hotel over in Decatur only to be so disgusted by the condition of the room and property (and scam artist calling the room) that we requested a refund and left (I'd never had to do that before, so believe me when I say it was horrendous). Rather than running all over the place trying to find a place last minute, we booked a room at Best Western Athens online, and drove on over. The desk clerk was friendly, efficient, and professional. She got us checked in and said the words that my stressed out little heart soared at..."remodeled" and "brand new carpet and bedding". Got to the room and it was wonderful. Clean and fresh. After showering away the memory of the other hotel, we got a fantastic night's sleep on an amazingly comfortable, fluffy bed. Grabbed a bit of breakfast from the continental breakfast bar (though it would have been nice if it had been open a little later). This will definitely be my go to hotel any time I'm in the Athens area. My family and I stayed at this Best Western on our drive from Ohio to Florida. There are many hotels in this area and from the outside of the building- it looked a little old and not as nice as the others in the area. However, all the rooms have recently been updated and it was very clean. My kids like the pool and the breakfast as well. Great service, friendly staff comfortable beds, clean, great breakfast. was there for funeral and staff was very considerate of other family members. staff signed a sympathy card and left it on our bed. That was So sweet! The air conditioning did not work, the door handle on the inside came off, the shower was ridiculous-the shower spay would not stay up. The water pressure on the shower was terribly low! You had to stand to the far right in order to get the t.v. channels to turn & if you were lucky you could change only two channels. The bed seemed squeaky and cheaply made. Price high. This is was in Athens, Alabama. Did not think the price was reason for town of this size. Found other BW motels in Tennessee for less than $70. Same quality and comfort. Would not stay at this motel because of price range. Very clean, convenient location, good breakfast, friendly and newly remodeled. The beds were very comfortable. The bathroom was very clean with no mold anywhere. The carpet was new as well as the furniture and beds. This was a newly remodeled room. The breakfast area was clean and the staff was very helpful. The breakfast food was hot and plentiful. The hotel was right off the interstate and on the main road. Restaurants were very close by. The front desk employee was helpful with any questions we had. This is one of the cleanest hotels I have ever stayed in. The rooms are average size and beds are comfortable. We were looking for a hotel to stay in during a softball tournament. You will not stay in a better hotel for the price. 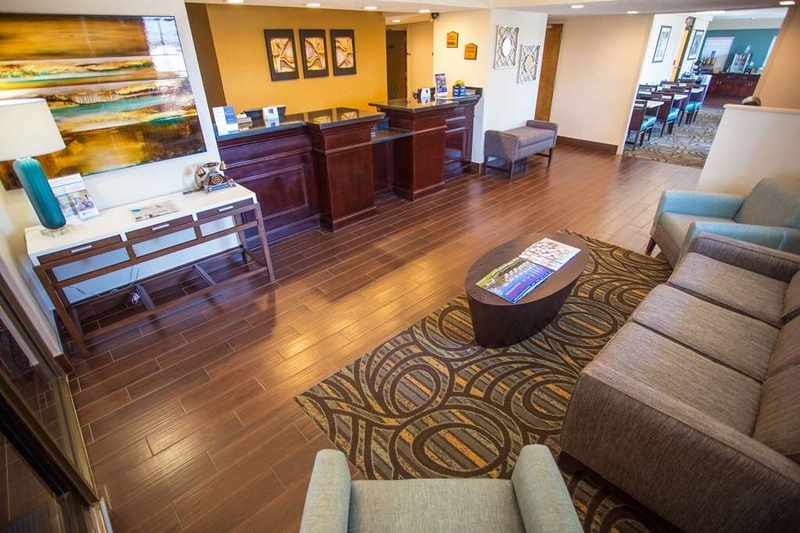 "Great overnight spot with lots of choices"
Front desk staff were very nice and accommodating. We got the "pet friendly" room, evidently because we booked through Expedia or whoever it was we used. The room was fine, just no carpet, hard wood floors. It was fine, however. The breakfast there was awesome. Lots of choices including a pancake maker. Good restaurants nearby and discounts at two of them would stay there again. This was our first visit to this hotel and it is a good choice for the price. Convenient location off I-65 with clean rooms and good continental breakfast. All rooms are direct outside access. We would return. "Great staff - great stay"
Great staff treatment on a very busy weekend when normally hotel staff would be flustered or short tempered but a very great mannered and helpful staff! Thanks for a very good end of vacation experience! Only been here for a night and I can tell it will be a great stay! Such friendly staff! Usually the staff gives me hell about my service animal and FIGHT with me to pay a pet fee.. But here they smiled and said not a problem! Such a relief after traveling today :) Very clean rooms, comfy beds, flat screen TV, nice bathroom and the sink is separated (common but I notice when they're not haha). Nice pool! Thank you so much for taking the time to write a response on Trip Advisor. We are so glad you evjoyed your stay and we look forward to serving you again in the future. We stayed overnight on a business trip. The rooms had just been remodeled and were clean and comfortable. We slept well. The staff was friendly and helpful. There are plenty of restaurants close by. Good place to stay. I don't know if I will stay here again or not. The placement of the room with the parking when traveling with kids and a dog was not good. I made 10 trips across the parking lot while my wife had to struggle with the kids and the dog, where as on the other hotels, the parking was in front of the room. Thank you so much for the wonderful review. We here at the Best Western Athens Inn do our best to make each guest stay a good one. We hope to see you again in the future. "Clean, Decent Hotel on a Road Trip"
Chose this hotel because of the good price. Most of the hotels around that area were more expensive with the same amount of good reviews. Our hotel was clean and had a good breakfast in the morning. Definitely worth the price we paid for a short stop overnight. The one negative thing I have to say is that the employees have a smoking area right outside of the rooms. To get to your car you have to go through this area and through the employees smoking together. It would be nice if that could be moved to a spot that guests do not have to walk by. Thank you for taking the survey . I have set up an area out back away from the Hotel now for employees to take their breaks and smoke. But I'm glad you found our Hotel clean and at a good price. We look forward to seeing you again in the future. 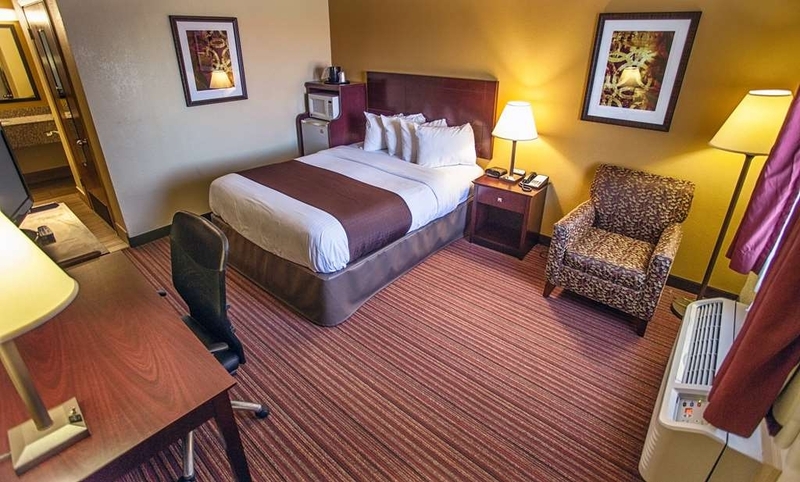 This Hotel is very conveniently located near the interstate with several good restaurants within walking and close driving distance. There is a Ruby Tuesdays and Applebees practically in the parking lot. The room we stayed in was newly remodeled and very nice with a comfy King Bed. The Wifi worked great! Most importantly, it was quiet. We plan to stay there again when we return. Thank you for the Trip Advisor survey. We are glad you enjoyed your stay with us and hope to see you again soon. If we can be of any assistance please give us a call at the hotel. "Clean comfortable room, but not accessible for handicapped." This room (110) apparently is supposed to be accessible, (even though we did not request it), but there are shortcomings in the execution. It was close to impossible from either of us to sit on the toilet; it is too close to the wall of the bathroom, and the paper holder digs into your leg. There is no bar to support exit from the tub, and the hand held showerhead is on a plastic hose, too high to be easily reached. The doors are wide, the clothes bar has been lowered, and the bed is approachable from one side. The other side is blocked by the cabinet holding the fridge and microwave. Our bed was comfortable, the room was clean, and the noise level was low, even being so close to the highway. The front desk staff we encountered were warm and welcoming. There is an Applebee's adjoining, making it possible to get dinner without having to get back in the car. I apologize for any issues you had with your room while staying with us. In the near future we are reconfiguring the single queen handicap rooms. I'm glad your overall stay with us was pleasant. If you are ever coming this way again please give us a call and we will assist you . Stayed here one night while traveling to New Orleans. For what we expected it was very nice had a fridge and was newly remodeled it was also clean and had no issues. Water pressure in the shower was weak but that is about the norm for these types of hotels. Applebee's is literally right in the parking lot, did not go because we got in late so no info on how that is. Tried to buy some bottled water from the vending machine and it would not take any of my dollar bills so gave up on that. Lots of people were staying here prob doing the same one night stop off we were doing. Would def stay here again. We are so glad you decided to stay with us here at the Best Western Athens Inn. If you are ever coming through again please stop in and stay with us. I apologize about the water pressure and will be looking in to this. Thanks again . Did I mention clean? You want to book here. Only issue is if you need late check out, be certain front desk uses proper procedure so housekeeping is aware. Oh, and there is $1.00 City of Athens surcharge thats not included in your online reservation total. "Clean room, be careful of staff smoking near doors"
This property was clean, the bed was comfortable and amenities were what you would expect from a property of this price. Be aware - no elevators, no luggage carts. And for those who are safety conscious - all rooms open to parking lot - no inside hallways. We felt safe, but I wouldn't stay in this type of room if I was by myself. Breakfast was adequate for a free breakfast - included apples and oranges, along with what appeared to be microwaved egg bakes, sausage, gravy and juices. Our biggest beef was that the cleaning staff who were taking a break near the breakfast room, were seated at a picnic table, smoking. Having to walk through that smoke to get to our room was distasteful. I provided feedback through a survey and was pleasantly surprised to be contacted within minutes by the manager. The hotel room was clean and we had a refrigerator and microwave. The breakfast was okay, the banana nut muffins were good. You can go right next door and get 10% off with your card. The staff was very nice and very helpful. "Newly updated ... great location for eateries." We traveled on I65 in Alabama stopping for the night. Breakfast was included. Great breakfast: pancake maker, biscuits and gravy, sausages, eggs and an assortment of Diet food. Free WIFI in the room. Bedding was comfortable with a large TV in the room. This was not pricey and met our needs. The greatest part was the many restaurants all around. Most were walking distance...any meal type from fast food chains to sit down cocktail restaurants. Request the first floor if you do not want to carry your belongings up to the outside second floor. An outside pool was available but we did not swim. We have stayed at this location once before on a previous trip, so decided to stay there again. Once again we were very pleased with all aspects of our stay. Clean room, reasonably priced, nice breakfast. Several restaurants to choose from within easy walking distance. Everything needed for a nights stay when traveling. The room was clean but we did not like having an outside entrance. The lobby area was small but adequate. The price was cheaper than others in the area but the quality was less than we usually enjoy from other Best Westerns where we have stayed in other places. Staff needs to be taught how to clean a room, too much dirt in areas that were clearly visible. They installed laminate floors so it's very easy to see what was missed. The bathroom's shower head was broken and when remodeled it wasn't finished completely. No tissue in the room had to use toilet paper. We could actually see where they walked on the floor after it was washed. This isn't our first stay at this particular Best Western and were surprised of the condition. The hotel was very clean and the staff was efficient and well versed on the local area. We were checked in quickly and the staff referred us to a restaurant that was very good. The room was very nice and the checkout staff was great. We stopped for an overnight rest and this place was really fine for that purpose. Easy on/off from the highway, a variety of chain restaurants very nearby, and a clean room with parking right outside the door. Second floor would be a little more difficult as there is no elevator. There is a small outdoor pool which looked clean and well maintained but we did not use it. Did not have the breakfast either, so can't speak to the quality of that. Very reasonable price, especially if you are a Best Western Rewards member. Even if you are an occasional traveler, it is worth signing up for that. Not bad for the price, parking was a bit tough. Outdoor rooms, which I prefer, but could be less price. People were very nice, though, service was great. Did not eat breakfast, although sounds very good with lots of hot options. Good, fast internet which is always a big plus. "Satisfaction after a long drive"
I had driven from Destin Fl and was tired.. The staff were very friendly and cheerful.. This is the second time I have stayed at this Hotel and was pleased both times.. A return will probably happen Its a shame that u need 200 characters when it can be said in less..
"Good bed = Good night sleep"
Stopped here on our trip from Chicago to FL. The room looked recently remodeled and the mattress looked and felt new. The nightstand had plenty of USB outlets for charging your device. In the morning they had a simple breakfast that was included in the price of your room. Recommended taking a sleeping aid and ear buds as I could hear traffic all night and people walking past our room. To it's credit, overall clean and bed comfortable. This was a stopover en route to New Orleans. Seemed a bit pricey, but we did get a senior discount being 55. I've stayed at this hotel several times. It is the half way mark between my home and grandchildren. Convenient to the highway it's clean and comfortable. This is not a luxury hotel but has all you need for a stay over. We slept well and the staff were great. Breakfast was good. The lady taking care of breakfast was constantly cleaning and refilling. This would not have been our first choice, but other properties were full. We were pleased. "Was given the smokin room"
I pleaded to no good response. I was stuck with the smoking room. I was told it was my booking service, I guess as a diamond member oit does not matter. I tried to enter the room. It wreaked too much that I had to back out. and returned the keys and told them the room was unacceptable. I was then told everything within 30 miles of huntsvill was booked full. I told them to cancel the room. Unacceptable is unacceptable.. It was true that the area was packed for some reason. "Road trip to Florida "
It was a halfway stop over to Florida. My daughter's 18th birthday. Our check-in was wonderful "Rick" @ Front desk, was extremely nice. Check in was very easy. Rooms very comfortable & clean. Lots of breakfast options an kept well maintained an stocked. I would recommend to everyone. "RICK" Appreciate everything an your kindess. We were at this hotel enrout from Florida towards Canada. Just an overnite stay but super. Staff were friendly and more than helpful. Room was very well decorated and very clean. Would recommend Best Western anytime. "Average hotel, average price, comfy bed ??" After a day in the car, we looked for somewhere that was close to the interchange, had restaurants nearby, and was affordable. This Best Western had all three. Said it was supposed to have a mini fridge and microwave, it didn't. But when we pointed that out they offered to bring them up for us! The room was clean, the bed was very comfy and the morning breakfast was ok. Checked in with my king room! It was easy and the room was large and clean! Then the wife called and needed to stay also! Went to the desk and asked I could be changed to pet room! Man said no problem but only have a queen! No biggie, he charged me 20 bucks! Same room but smaller and had hardwood type floors! I am sure this helps with pets! Room and bed were clean! Only complaint is room 103 is at the end and next to snack and ice room! It got pretty noisy! I sleep deep so I had no real issue! Having my dog with me overcame any complaints! You can walk to 5 or 6 sit down and fast food places to eat! The breakfast did not exactly excite me but it's same fare offered in mornings at most places! The motel gets pretty full! I stay at the Fairfield or Holiday Inn most stays but with the dog and over a 100 bucks cheaper a night, I will be staying here again with the dog and maybe without! Stopped here overnight on our way traveling with family to Fort Benning. Booked 2 rooms on my phone a couple hours before arriving based on feedback left from others, and we were very pleased. Conveniently located just offf the highway, so was easy to get to. Check-in was a breeze, super nice and helpful gal at thw front desk. Both rooms were very clean and comfortable, AC worked, no weird smells, no problems with anything. Room rates were reasonable. We were given a 10% discount on our dinner at a restaurant nearby just for showing them our room key. Breakfast was good too. Would definitely stop here again on our next trip next summer. We booked this hotel in advance as it was midway to our destination. It seemed to be a popular place for those heading south to Florida. The room was clean and comfortable, with places to eat nearby (although most were closed because it was Christmas). We received a great rate and were satisfied with the stay. You can park right next to your room which has an outside entry, which we prefer when stopping over for the night (easy unload/load). "Nice Place to Stay on a Long Drive"
It was a good hotel at a good price. Nice breakfast and the manager is very nice and helpful. The rooms were clean and the bed was comfortable. I would recommend this hotel and I would stay again for business and pleasure. "Just OK, but price is right"
It was clean and fairly priced. Seems like an old hotel with a few problems here and there but nothing major. The toilet seat was a little loose, and the toilet paper holder looked like it was about to fall off the wall, for example. There is no elevator to the second floor. Carrying stuff up the stairs was a hassle. The hotel clerk offered to give us a first-floor room for a few dollars more, but we decided to do the climbing instead. The traffic noise from the interstate might bother some. Ask for a room on the opposite side of I-65 if this might be a problem for you. I stayed here on an overnight while driving from PA to LA. Hotel was easy to find right off I-65. Location was great. Featured restaurants in the immediate area - Starbucks, Applebee's, etc. Gas stations, too. Room was in nice condition. Size was just right for an overnight. No cleanliness problems. I would stay here again for a similar occasion. This is the best hotel I have stayed at in a very long time. Even though my stay was extremely short, I will be using this hotel again! Extra speedy service and nice rooms very clean over all appearance. Very courteous staff! I had an very good overnight that I booked online a few days prior. This was not my first stay at this location and I was not disappointed with the quality and service , even considering some of the rooms were under renovation. There were no disturbances from the construction and I was promptly notified when I arrived. Very professional !!! The Best Western Athens, Alabama more than met our expectations. Despite our very late arrival our check-in was hassle free. The rooms were very clean and well furnished. Breakfast was plentiful and more than met our expectations for a free hotel breakfast. This motel is very close to !-65 and very convenient, close to many restaurants and gas stations. We would highly recommend this motel and if we ever find ourselves in the area again we would definitely stay there. Motel price for a hotel experience. My husband and I chose to stop in Athens on our way home from Disney World. We booked our room on Trip Advisor based on their ratings and price. The other three hotels that were rated "very good" to "excellent" were $20-$40 more expensive for the night. I have to say, based on our past experiences with cheaper hotel rooms, we were pleasantly surprised with the cleanliness, comfort, and number of amenities this hotel offers. The staff was very friendly and welcoming (even at 9:30pm). The room had recently been renovated. The decor was very tasteful and the bed was comfortable. The only down side of our visit was that they were still renovating the hotel and we're woken up by construction workers earlier than we expected. 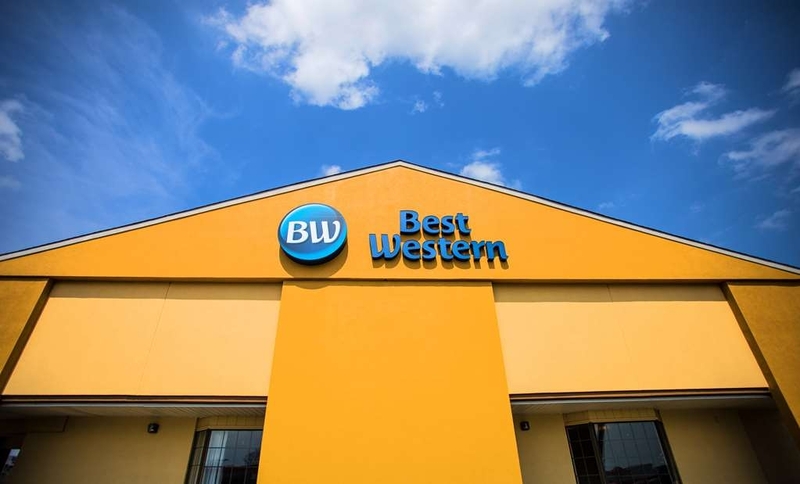 This being said, we won't consider booking anywhere else except this Best Western should our travels bring us through Athens again in the future! 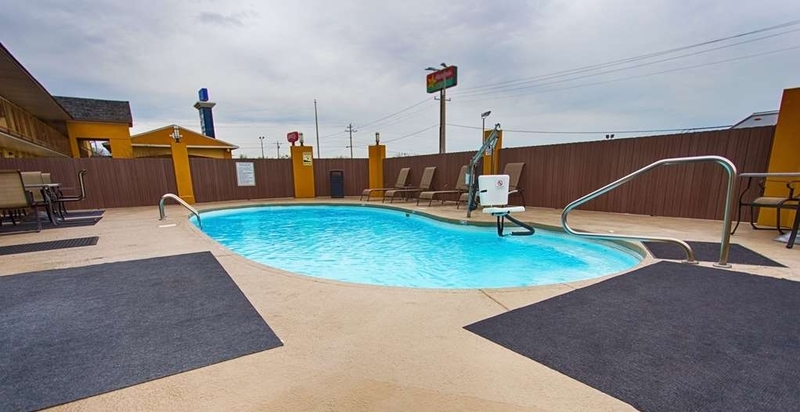 "Review of Best Western Athens, AL"
The stay at this hotel was absolutely delightful. The unicorn petting zoo was an interesting touch, but made for a memorable trip. I am a bit concerned that their sharp horns might be a safety risk for children. But all in all it was a great experience. Dear Valued Guest, Thank you for taking the time to tell us about your stay at BEST WESTERN® Athens Inn. We are glad that you enjoyed your experience here in Athens, Alabama. We hope that you will return to visit us again soon. And we'll file those horns down, rest assured! Thanks again! Sincerely, Lynn Horn General Manager BEST WESTERN® Athens Inn. This is a very nice property and very well managed. GREAT shower, GREAT bed and TV in the rooms- I was VERY pleased and will be back for sure. For what it's worth I noticed a lot of snowbirds who were passing through from Illinois and Indiana so apparently they've discovered this hotel also and liked what they see! The staff was most accommodating and extremely helpful. We were driving in the snowstorm and weren't sure we would make it to Athens, Alabama. The front desk manager told us if we couldn't make it not to worry just stay safe. Breakfast was a nice addition. Did not use the Wi-Fi. The staff is extremely nice and helpful. The rooms are very nice and clean. They are remodeling so there is a little "dust" on the outside to excuse but the hotel is very clean and affordable. I have stayed at this same hotel 5 times since October 2015 and have never had a complaint. We only stayed one night, but have to say this was one of the nicer BW's we've stayed in. Room was immaculately clean, everything worked as it should. Nice to have an elevator, many don't. Price was reasonable. Morning breakfast was o.k., but the scrambled eggs were a bit tough. Fresh juice was a nice touch, though. Stayed overnight on way from WI to FL. Facility is in process of being renovated. Our room was recently completed and carpet had a new chemical smell that hurt my eyes, but that subsided the longer I was in the room. Had a fridge but no microwave. Extremely comfy pillows--- loved them! Ask for a first level room and you can drive right up to your door. Hotel is adjacent to freeway, so recommend room on opposite side of hotel. Ours was on freeway side and had to run air conditioner to drown out noise. Applebees restaurant was within feet of hotel so that was nice for dinner, and breakfast at this hotel was wonderful. Sausage and gravy over biscuits, scrambled eggs, plus the best link sausage I've ever eaten in a hotel. Very friendly staff. Easy on and off the freeway, plenty of gasoline, shopping and food choices nearby. Highly recommend for an overnight, clean and comfy stay. "A Most Pleasant Stop, Good Price & Highly Recommended"
We were on our way from northern Ohio to Santa Rosa Beach, Florida and stopped here for the night. The staff was friendly and got us checked in and in our room with no holdup. The next morning, we had the normal good BW breakfast with eggs, sausage, biscuits & self made waffles. We will be back. "Best Bisquits and Gravy !!!" Clean, quiet, comfortable beds and dog friendly (ask for a pet friendly room - they are limited). Really nice room for all of us. Had laminate floors so I didn't worry about what was left in the carpet from other pets. Ground floor level made it easy to get in and out with a dog. Very nice stay. My wife and I were were visiting family and needed an one night stay for the trip. We picked this hotel based on location, value and the reviews we read on Trip Advisor. I must admit, I have stayed at a few Best Westerns that I would call "average cheap overnights" at best. This place, however, exceeded my expectations. Very clean, easy check in, and a great little breakfast. I'm sorry we stayed in January because the pool looked very inviting. There is a bit of construction going on, but it is easily overlooked. If you are in the area, stay here!! I apologize that the taxes appeared high. Every Hotel has taxes required to be charged. Unfortunately we have no control over this. Also we are in Athens , Alabama not Tennessee . This was the 2nd time we stayed at this hotel. It is in the process if being updated. Rooms are very nice. Staff from front desk to maintenance are very friendly & helpful. A few nearby restaurants offer a discount to you if you mention you're staying ago the Best Western. Breakfast is good, you can make your own pancakes. am sure we will stay there again. "Overall pleasant stay despite construction going on." Pleasant stay with no complaints. City trash pick up seems to start at 5 AM, which wakes the dead. This may only occur only on a few days a week. Construction and renovation livable, nice place to stay..
Have stayed here 3 times and was pleased but am amazed the renovations done to this property. Rooms were fantastic, comfortable and clean. Has good location with restaurants to walk to. Quiet and peaceful. Can't say enough good about it and the staff. I am truly appalled with my experience at this Best Western. Prior to making my reservation to stay at this hotel, I reviewed several other hotels in the area to find one specifically that was pet friendly, served complimentary breakfast and was located close to the interstate, as we were travelling to visit family around the holidays. I contacted the hotel PRIOR to making the reservation to confirm that these details were true and that there were no stipulations. I was informed that all we needed to do if we were interested in bringing a pet was to relay to the front desk staff upon arrival at check-in that we had brought a pet and no additional fees would apply. Upon checking in, we did just that. We announced that we had brought a pet with us. There was nothing additionally said by the staff regarding any additional fees or concerns about *special pet rooms. * The next morning, we ate at the complimentary breakfast as a family and sat while shooting the breeze with the staff. After eating, we went back to our room and in *plain daylight* went outside and walked our dog around to go the bathroom. Afterwards, we went and checked out of our room and didn't think much more about our experience at the hotel until several days later we saw an additional charge on our credit card of $122.40. Thus concerned with having no idea what this fee was regarding, I contacted the hotel. I spoke with Alicia who stated "you were charged a pet fee for not disclosing that you have a pet." This is absurd I told her and explained the above information. I then asked to speak with a manager. Ms. Alicia then informed me that there was no manager available and that I would have to call back later if I wanted to try and speak with one. I did just that and got in contact with Craig who requested that I call and speak with the GM Lynn on Monday, today, Jan. 4th. After I did this and spoke with Craig for the second time, Craig stated, Lynn's not available right now and frankly, I already ran this by her the other day and she said the same thing, it's pretty much Alicia's word versus your word and who are we going to believe. I then requested to still speak with the GM to discuss my concerns. Craig then rudely responded, "yeah, I'll take down your number and if she has time, she'll call you back I guess. "- Folks, this is customer service at it's finest. (*I'm not being sarcastic at all here) Please, by all means, if you want terrible customer service and to stay at a place that can electively choose when to charge additional fees, stay here!! As a note, I travel often and this place will never have my business again. I fully intend to continue to pursue this issue and ensure that corporate hears about this incident as this unfortunately represents poorly on Best Western as a company. Having stayed here 8 times en route to Florida, I made a reservation online and requested a first-floor pet-friendly room. My reservation was confirmed. When we arrived, the clerk indicated that we had a second-floor room that was not pet-friendly, and no other rooms were available. When pressed, she called Days Inn and they had a room for us. It's not as if a different room would have been a small inconvenience -- what did they think we could do with our dog if she couldn't be in our room? I will not be going back to this motel ever again. We pretty much look to stay at Best Western hotels because of their consistency. This place is "typical" Best Western - nice clean rooms, good prices, good breakfast, nice employees, and a great location. Plenty of hotels in the immediate vicinity, however this one had the best discount rate for us as retired military members. It is a nice hotel which is in the process of renovation. Our room seemed to have been recently cleaned, painted, etc. For our purposes of an overnight stay, this was a good choice. The room was smaller than we normally get when not traveling in our RV and would have been felt tight if we stayed for a longer period. Parking is adjacent to your door..which we like. Plenty of restaurants in the area and the hotel gets a 10% discount at a couple of the them. Breakfast was good though the space was an issue when multiple families arrived at the same time. My lower mark had to do with our reception. We were given keys with no direction as to where the room was located as the clerk went right on to the next person. We are Rewards Members. All in all a good stay. "Best Western the best place to stay." 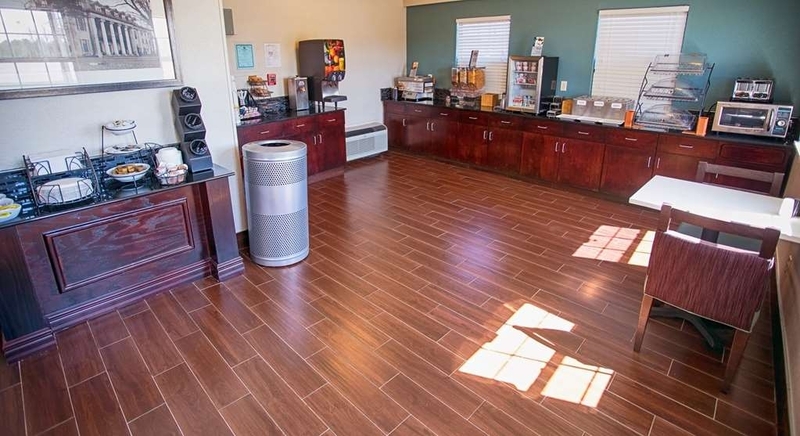 I have stayed at many hotels and motels over the years and Best Western seems to be most consistant as to good quality and value along with very competent, friendly and helpful staff. I have been pleased after staying with Best Western and I cannot say the same of other hotel or motel chains. We only stayed one night on our way down to Florida. Had booked a king bed room & requested a ground floor room. Our request was granted. The room was very nice & recently renovated. Nice big parking lot, nice lobby, & the staff was very nice. We will be making this our stop in the future when we head south. It was a good stay, considering they were doing renovations. The Front desk staff was very friendly. The breakfast was good and the server was very friendly. The location was a little hard to get into. "$20 pet charge - why?" The hotel is undergoing extensive renovation but its clean, and located in the midst of restaurants & very near the interstate. Service was good, breakfast was exceptional!! My main issue with this hotel is the outrageous pet charge. The night before I stayed in a wonderful Red Roof in Tupelo with a pet charge of $0.00. Our room had a very worn rug and peeling plywood on the bathroom door but since all the rest was clean and fine we were happy. Love that this hotel was pet friendly as we travel with our sweet beagle. She is house and crate trained so she is not a problem. The check-in and check-out person were both very helpful. We did not eat breakfast but it was offered. Good Value. My first stay at a best western. trying to save money as I usually stay at Hampton Inn. I would stay here again. As motels go, this was very clean, and the room was nice. The desk clerk was preoccupied when I arrived, but wasn't rude. "Very pleased with hotel stay"
Very Clean and Quite. The value for the stay was much better than other hotels in the area. Walking distance to restaurants was a huge plus. The outdoor appea was also good as well. Would stay here again. We stopped here for a few hours sleep on our way to Florida and the front desk agent Rebekah was sweet, patient and helpful. Our orginal reservation was cancelled due to it being after 2 am and the credit card on file was unable to be charged (our fault) She could not give us an employee discount through her system but was very patient as we called to have our best western make a new employee reservation so we could get the employee rate. We were very impressed with her exceptional customer service and her friendly attitude. The room was clean, good sized and comfortable bed. The complimentary breakfast was enough to start your day off right. The front desk agent in the morning was cheerful and friendly as well. Would definitely stay here on our next trip to florida. Only complaint would be the square pillows on the bed. Room was big and clean. The free wifi was easy to access. The breakfast was one of the best we've had at a hotel in a long time. Egg & cheese omelettes, 2 kinds of sausage, biscuits & gravy and much more. Water pressure was lower than normal in the shower but sufficient. We would stay here again. The hotel being close to the interstate made it a PLUS to be so close to where the party and wedding was held. The price was good for the room. Remodeled rooms was great. The staff was great in all departments. Thanks, till next time. great hotel, great place, great staff, delicious breakfast, beautiful also the pool and the gym although I could use them on. Very nice coffee machine in the room. The position in which it is located is perfect. Beautiful experience. I was attending the Storytelling Festival and booked a room in the Best Western. The room was clean and ample space for the three of us. It was right in the middle of a bunch of restaurants, which was very convenient. They served a hot breakfast which had lots of choices. This is the best place to stay in Athens for the money. I look for a clean, comfortable and safe place to stay, and this hotel meets all. The location is very convenient to local restaurants, within walking distance, and easy to access from the highway. The staff is very helpful and courteous. Highly recommend it! "A place to lay your head"
We stopped just for the night on our drive to FL. The building is old in need of a facelift, the location however is perfect. It is located right next to I65 and has a few restaurants that share the same parking lot along with a Holiday Inn Express. The bed was worn, pillows were flat, the carpet was old and the whole room just seemed tired and need of some TLC. This is more like a motel with all doors leading directly outside and parking was crowded, not enough spaces. The breakfast was nothing special and was not stocked. Next time I will book at the Holiday Inn Express next time. My husband and I stayed two night's here. Room was clean. Bed was comfortable with 4 pillows for a king. Small refrigerator & microwave in the room was clean. Bathroom was clean. The toilet was a little rocky (Not sure why). The free breakfast was good and hot both mornings. The staff was very polite and was answered all my questions with a smile on their face. I would stay here again if I'm ever back this way. The hotel was undergoing renovation, but was very clean and nice. Staff friendly. Great breakfast. Bed was horrible and made for a terrible nights sleep, but staff said it should be replaced in the renovation. Getting to this facility was pretty easy, right off the interstate. Our room was comfortable though our beds are about at the end of their usfulness. Bathroom lighting is admirable and water pressure is very nice. This makes a lot od difference when using the shower. The eastern facing rooms are pretty close to a restaurant which is a distraction with lighting though pretty convenient for food. This Best Western is a nice facility. We stayed here during the Tennessee Valley Old Time Fiddler's Convention. We stayed here last year also and the service is good, rooms clean, and location convenient. We look forward to staying here next year. Best Western was probably the best hotel for the price in the Athens, AL area. While not outstanding, and we did not receive the best discount, it was very adequate for our needs the two nights we stayed there. The hotel room was impeccably clean from the main room to the bathroom! The room was modern and comfortable. The breakfast was delicious and hot! Great service on short notice! My husband had been feeling ill and we needed a room right away and we looked for a Best Western because we have booked with them before and have been very pleased! "Cleanliness is always good "
Stayed here once again because I feel not only is the staff friendly, but this place is clean. Has frodge and microwave. Located next to Applebee's and IHOP for convenient dinning - I highly recommend this place for sure. "A Clean Place to Stay with Friendly Staff"
This is a very convenient hotel to North Alabama. I actually stay here and drive to Decatur which has a lot more hotels but this one more than makes up for the distance and has great staff. Breakfast is good also.